Johanna Fanning, daughter of William Fanning and Honora McCormack of Lisaroon, married William O’Connell on Feb 11, 1850 in Inch Parish Co Tipperary. I came across this daughter when I realised that the priests of Drom Parish were entering the residence name places in the marriage registers. These unindexed registers are now online and free at https://registers.nli.ie/. 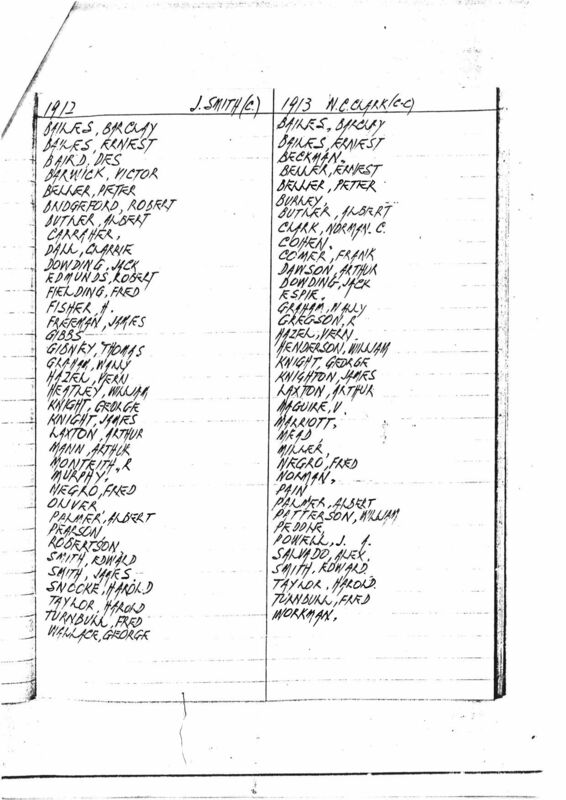 Placenames being included on a few registers is incredibly helpful for family researchers. Knowing that couples were nearly always wed in the bride’s parish I looked for Lisaroon in the margins of the Drom mariage registers and came across Johanna from Lisaroon. 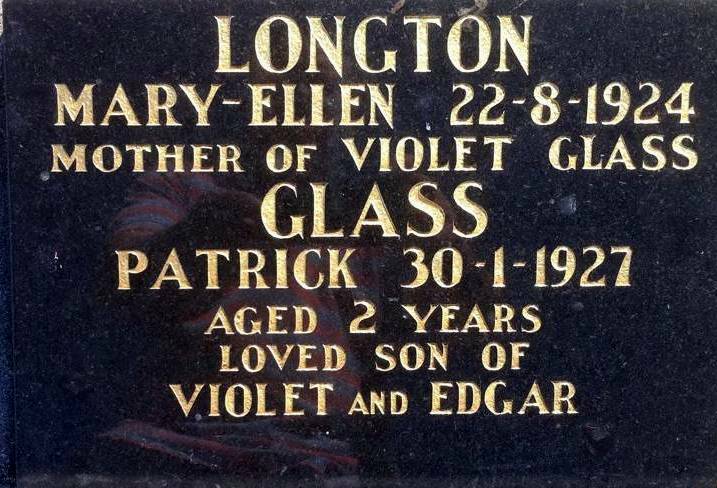 As far as I can tell there has only ever been one Fanning family in Lisaroon (Lissaroon) townland in Drom Parish, so she had to be a daughter of William Fanning and Honora McCormack. Harder to find grooms as they were married in the bride’s parish. It was such a worthwhile investment of resources and time looking through these newspapers. I found all sorts of fascinating and interesting stories and facts about my ancestors. 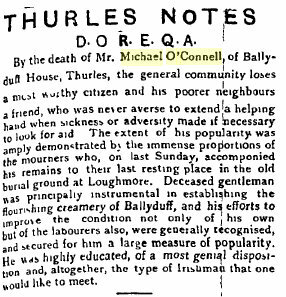 I found a couple of extensive obituaries on the O’Connells. Michael was born on 6 Mar 1851 and his sponsors were Martin Eviston and Mary Duggin. William was born on 11 Apr 1852 and his sponsors were Tom Fanning and Honora? Connell. Denis was born 16 Jan 1854 with William Fanning and Margaret Eviston as his sponsors. His twin John was sponsored by Pat Fanning and Honora Eviston. Most of the O’Connells are buried in Loughmore Cemetery in Co Tipperary. I have been trying to trace the “cousins” listed as attending the funeral of Rev Martin O’Connell. They are all related, but not as directly as cousins suggests, but still a source of further connections. As Martin O’Connell was 64 when he died in 1916 his “cousins” go back quite a long way and some of the connections I’ve made can’t be conclusively proven. Denis O’Connell DC of Loughmore was his brother. Their parents were James O’Connell and Mary Carroll. (O’Connell was written as Connell in earlier records). 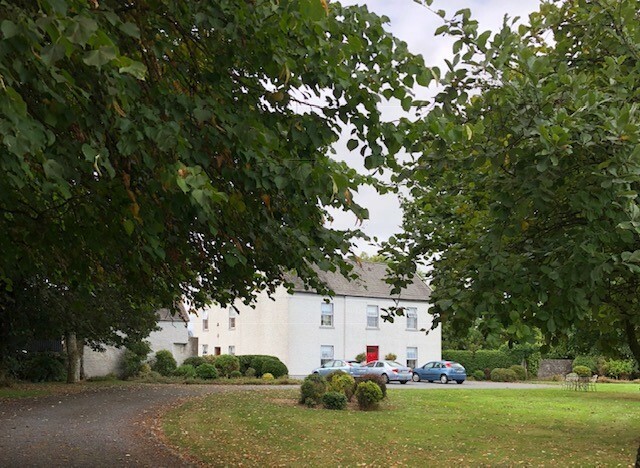 James O’Connell of Oldbawn Cottage Loughmore and Martin O’Connell, Daniel O’Connell and James Eviston, all of Loughmore, are all Martin’s nephews. James the son of Mary Eviston nee O’Connell and Martin Eviston. Mary being the half sister of Denis. Annie and Ellie are daughters of Martin’s brother Denis. Mrs James O’Connell Denis’ daughter in law. Mrs John Sheedy is Mary Sheedy nee O’Connell; Mrs Patrick Maher is Catherine Maher nee O’Connell; Mrs James Doherty is Elizabeth Doherty nee O’Connell. All daughters of Denis and Ann O’Connell. 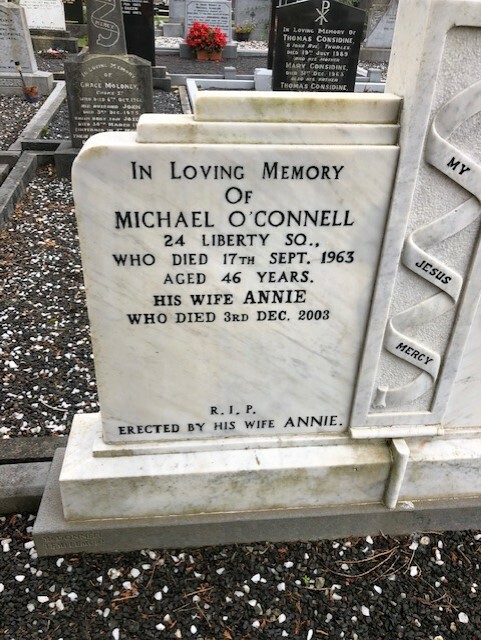 Mr Michael O’Connell of Maryborough was the son of William O’Connell and Bridget Coffey of Castleiney and was a doctor. 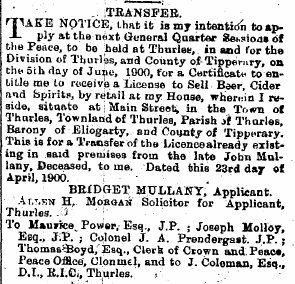 A Thomas Duggan of Borris married a Julian Connell of Loughmore on 2 Mar 1829. 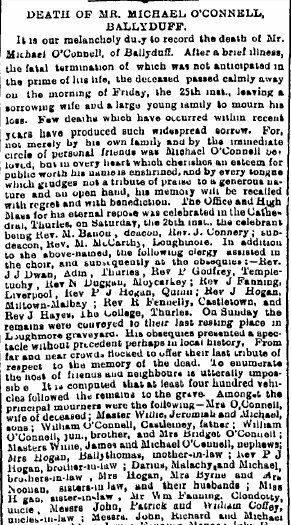 Tobias McGrath was the son of Michael McGrath and Mary Fanning who were married in Drom Parish 12 Feb 1861. John Connolly was baptized 12 Aug 1864. His parents were William Connolly and Ellen O’Connell. Address given as Main St Templemore. 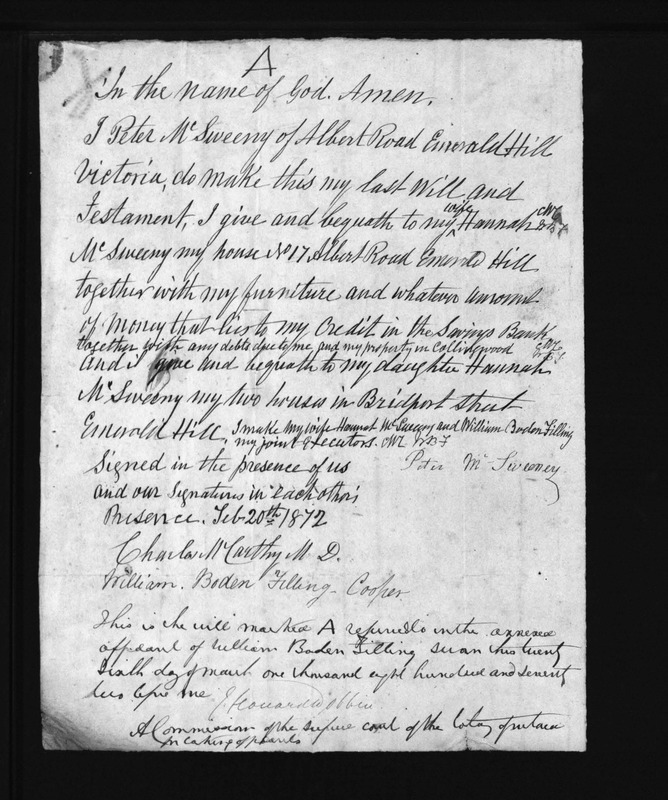 A Michael Lannigan was baptised in Aug 1819 in Templetuohy. His parents were John Lanigan and Bridget Connell. Sponsors were Judith Connell and James Kinahan. There was a marriage in Loughmore Parish on 9 Jun 1801 between Richard Quinn and Mary Connell witnessed by Michael Connell and Sally Quinn. 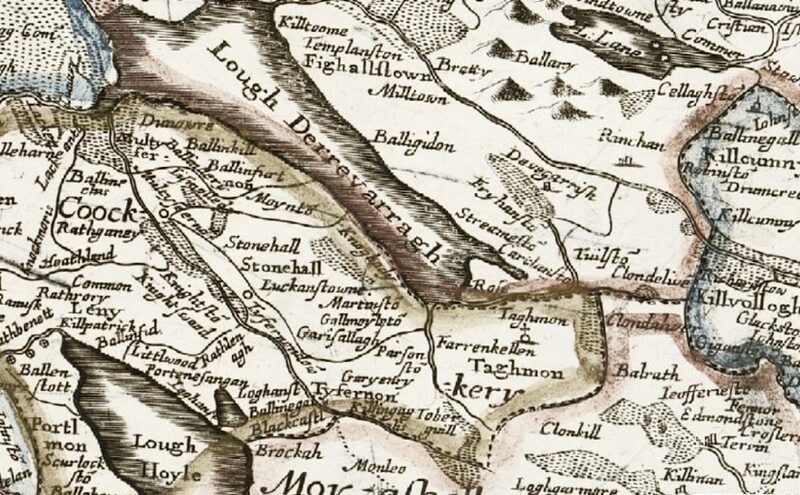 In 1805 Denis Connell was baptized in Loughmore parish. 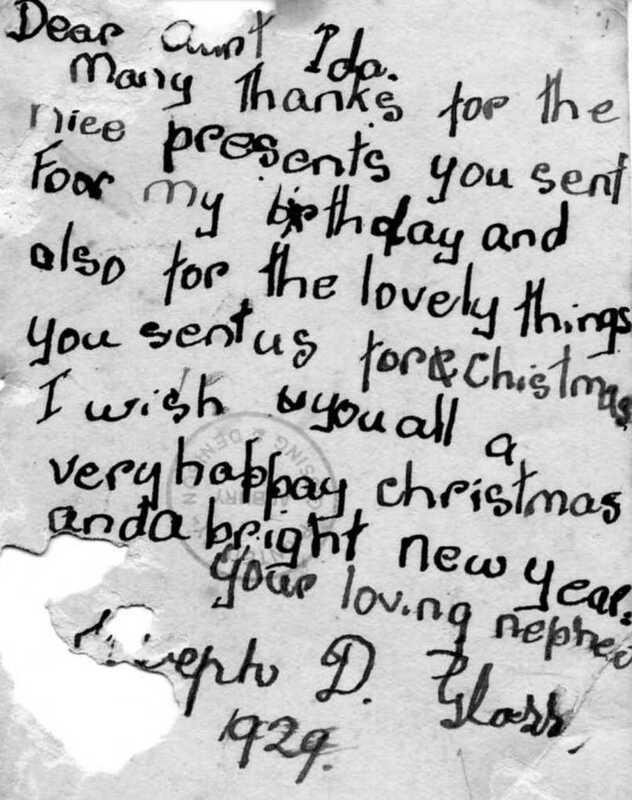 His parents were listed as Jeremiah Connell and Bridget Quinn with John Delahunty and Mary Ryan as sponsors. 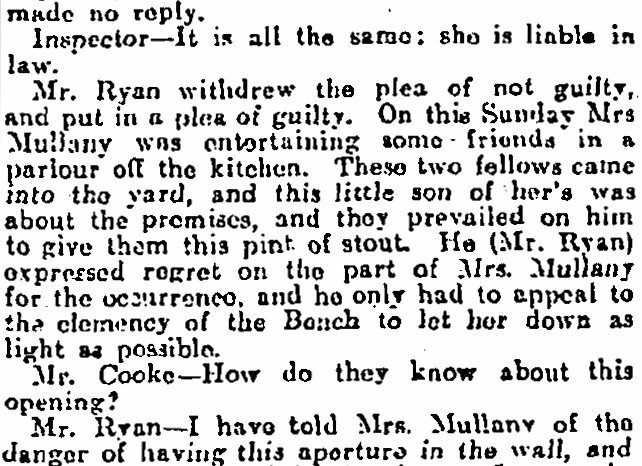 On 2 Feb 1826 there was a Richard Quinn married to a Mary Connell. Both from Castleiney. 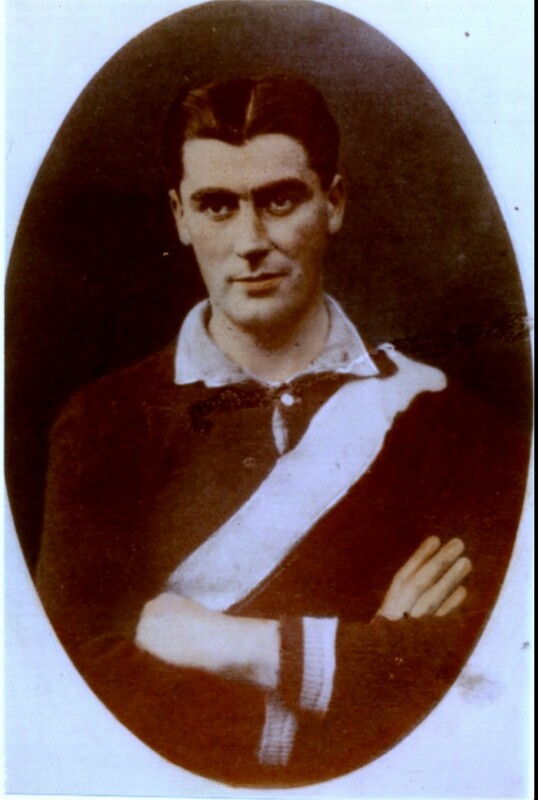 D McCormack of Oola was married to Bridget O’Connell nee Coffey’s sister. E. Fanning listed as a cousin was Edmund Fanning who married Hanoria Molloy in Littleton Parish on 11 Feb 1902. His address given as Holycross and hers as Ballybeg. He lived in Glenreigh in Holycross. 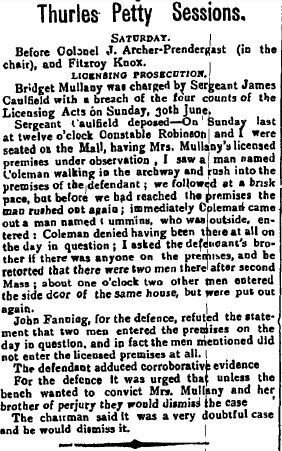 Francis Dwyer and Bridget Fanning were witnesses. Edmund was born in Loughmore parish at Kilcoke on 23 Dec 1848. His parents were James Fanning and Judith Hoare. Judith fanning nee Hoare is buried in Holycross Cemetery. She died 20 Apr, 1879, aged 68. her husband James fanning died 2 Oct 1885 aged 77. 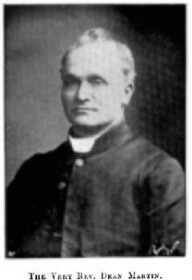 Their other son was the Rev James J fanning who died 10 Sept 1909, aged 65. His nephew was Rev P Fogarty. The brother of this James Fanning was the Rev John Fanning buried in Loughmore Cemetery. He was born 10 Nov 1805 in Loughmore and died 13 Aug 1891 in Glenreigh Holycross. I have not been able to figure out how Edmund Fanning of Glenrieigh and Kilcoke is related to Martin O’Connell. 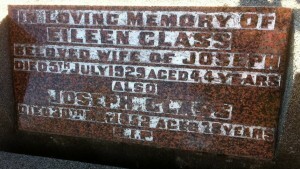 Eileen Mackey married Joseph Glass in Melbourne on 20 November 1919. Eileen called “Sis” was my grandmother’s sister. 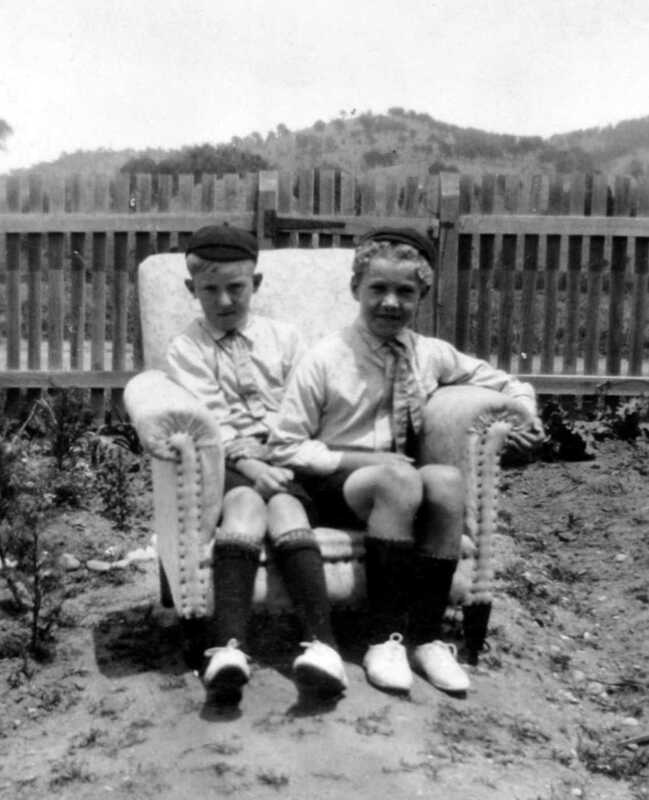 When my father was growing up he had a lot to do with his cousins, Joe and Bernard, sons of Eileen and Joe, even though they lived in country Victoria at Yackandandah. 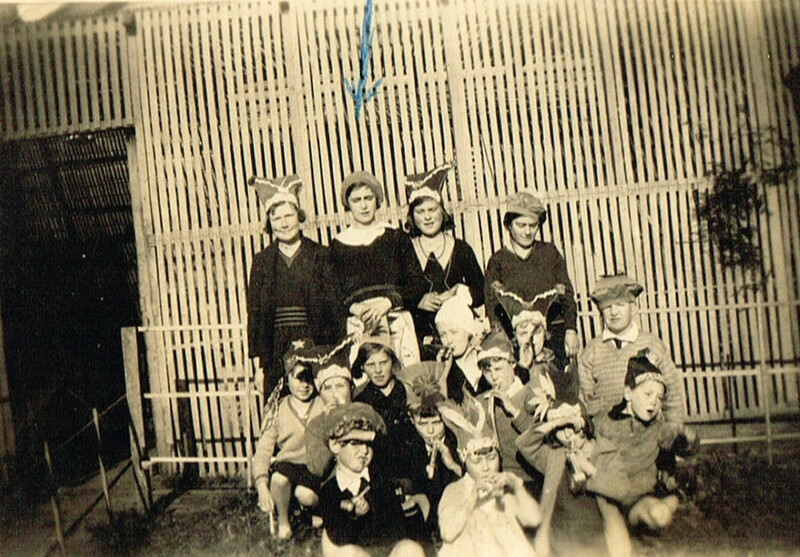 Because of his fondness for his cousins I have included old photos that we found in a biscuit box and information I have gathered on the Glass family in my Fanning research. 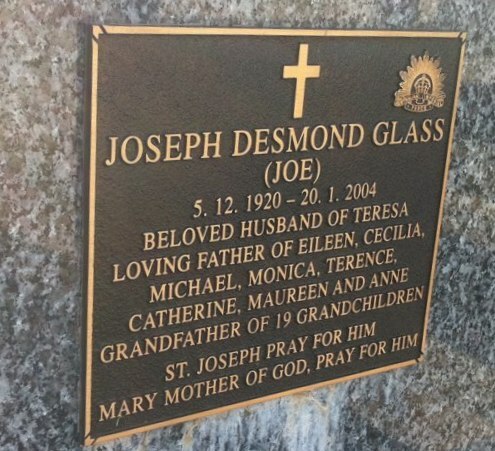 While I am not a direct Glass descendant I hope these photos and the report may be of interest to those who are directly related to the Glass family. I would love to know who the other people are in the above wedding photo. 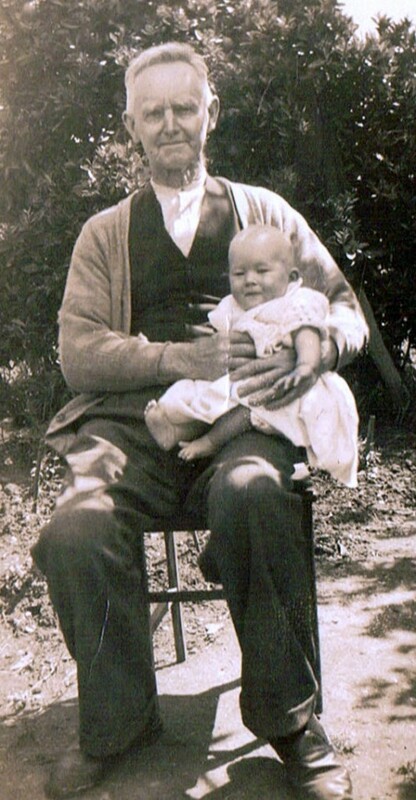 Joe Glass and 7mths old Eileen Fanning, my aunt. Thanking their Aunt Ida, my grandmother. 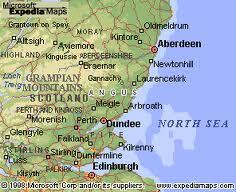 My maternal great grandfather Robert Eason Cook’s family tree can be traced back to 1837 in Dundee Scotland. His father, James Eason Cook, was a boat builder and born about 1837 in Dundee Scotland, in Angus, a maritime county in the east of Scotland. On both his marriage and death certificates his place of birth is given as Dundee. On his marriage certificate to Ann Lord Senior his mother’s name is Isabella Hodges. I have been unable to find his birth record or to find his family on any of the Scottish census records. He came out to Australia about 1850. 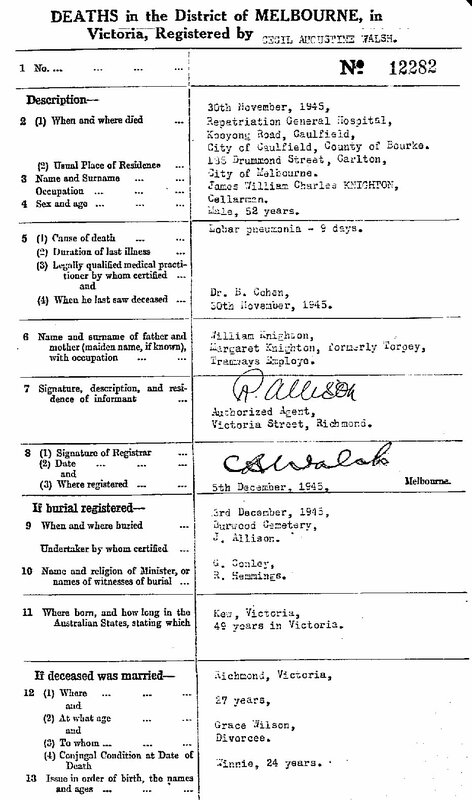 His death certificate states he spent two years in NSW and three years in Western Australia and 59 years in Victoria. A direct descendant of James and Annie Lord Senior told me the three years in Western Australia were in Kalgoorlie and he was gold mining there. Gold was discovered in Kalgoorlie in 1893 so it had to be some time after then. He also told me that James Eason Cook was married three times. I have found a record for a James Cook who came out in 1854. This is possibly but not definitely him. If he was born in 1837 he would have been 17 when he arrived on the “Kurrajong” in Sydney. 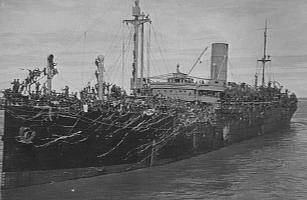 The “Kurrajong” was a merchant ship. He may have put his age up. If he was 17 that makes him 22 when he married Mary Condon in 1859. 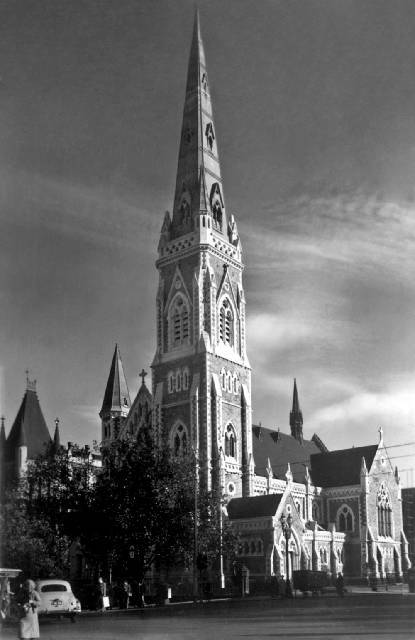 He married Mary Condon, an Irish woman from Co Cork, in 1859 at the Church of St Francis Melbourne Victoria. His occupation was given as seaman and his father was a boat builder. 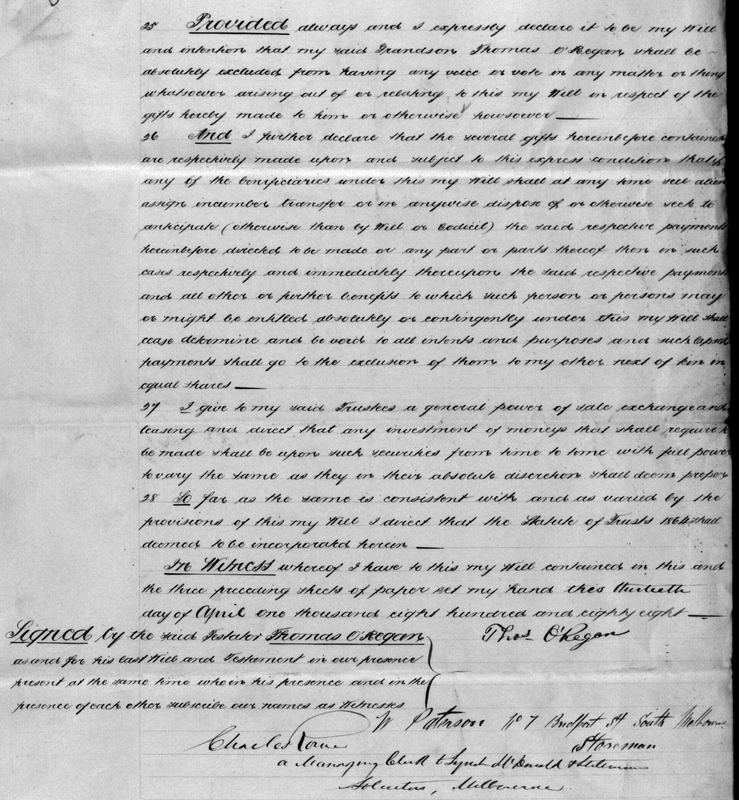 Marriage Certificate of James Eason Cook and Mary Condon Melbourne 1859. 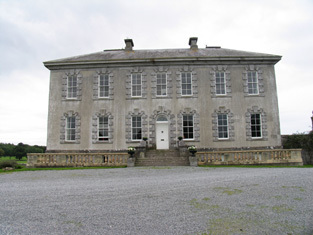 The Condon family came from the townland of Ballynamona in the Catholic Parish of Mitchelstown in the Diocese of Cloyneand the Civil Parish of Brigown in Co Cork. Later another, no doubt related, Condon family from Ballynamona emigrated to Victoria. That was Garrett Condon and his wife Ellen nee O’Gorman and their son Maurice. In the 1901 and 1911 Census records for Ballynamona there are lots of Condons still residing there. 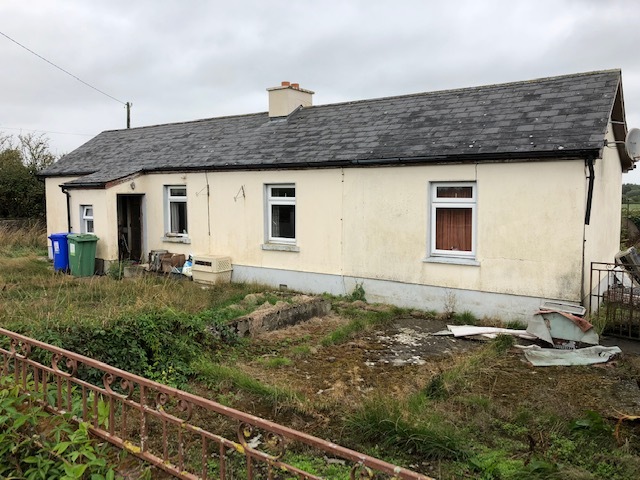 Ballynamona is a small townland and in Griffiths Valuation in the 1850’s there were eight Condon families living there out of a total of nineteen entries. Condon seems to have been a common Cork surname. Ballynamona Townland Co Cork Griffiths Valuation. Mary Condon came out in on the Star of the South with her sister Bessie on Aug 5 1857. 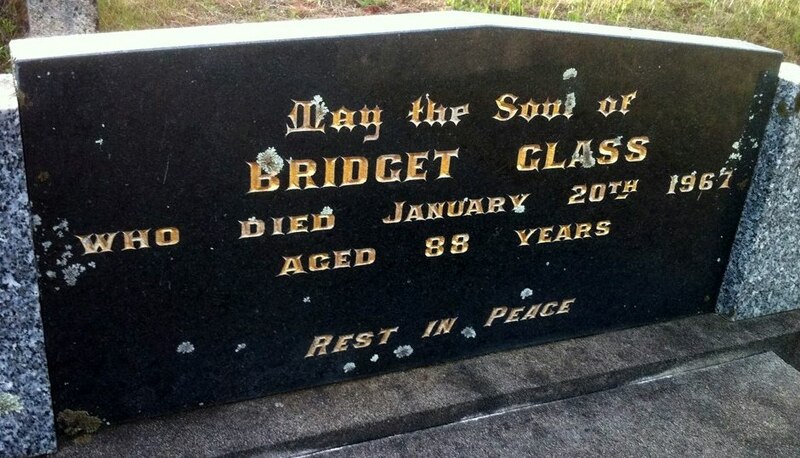 She was aged 20.. A brother and sister Bridget were already in Melbourne. 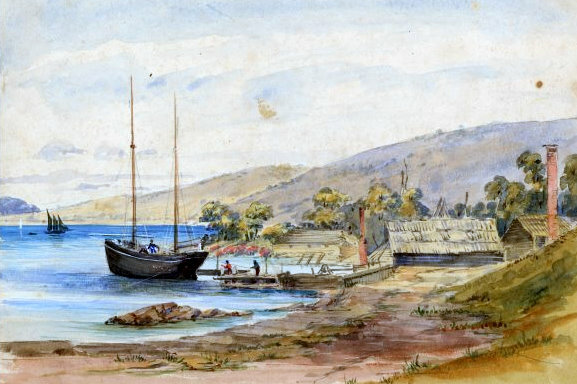 They lived at Snapper Point Mornington and had eleven children between the years 1860-1879. The township of Mornington developed from the first settlement at Snapper Point. Mornington had a good deep water port and became the link between Melbourne and the Mornington Peninsula. There is a record on the Victorian Heritage database of James Eason Cook having built the schooner “Sybil” at Mornington in 1874. In 1877 The Argus 31 July reported him as standing for election as mayor at the municipal elections. He was unsuccessful. Unfortunately in 1880 he was declared insolvent. Melbourne’s cable cars began operation in 1885 so if James was involved he may have worked for this company. Gold was discovered in Kalgoorlie in 1893 and James may well have spent the next three years over there trying to get his finances in order. 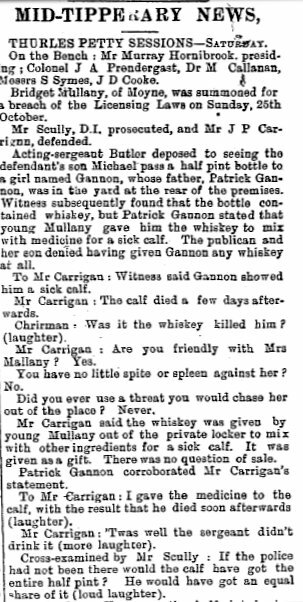 His wife Mary Condon died of consumption (tuberculosis) in 1896 in Prahran Melbourne. She had been in Victoria for 39 years, so came out about 1857. 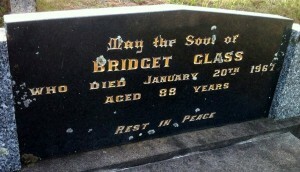 She is buried with a Bridget Condon, most likely her sister, in Melbourne Cemetery. Bridget died when she was 22 in 1859, the same year that Mary married James Eason Cook. On Bridget’s death certificate it states she had been in the colony for six years which would mean she came out about 1853. 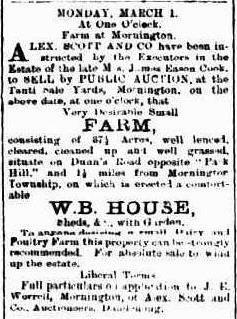 The sale of the Mary Cook’s farm at Mornington was advertised in The Mornington Standard on 25 Feb 1897. After his wife’s death James Eason Cook moved from Mornington to the city of Melbourne. In 1898 he married Annie Lord Senior and they had two children, Margaret Newbury and Joseph William. 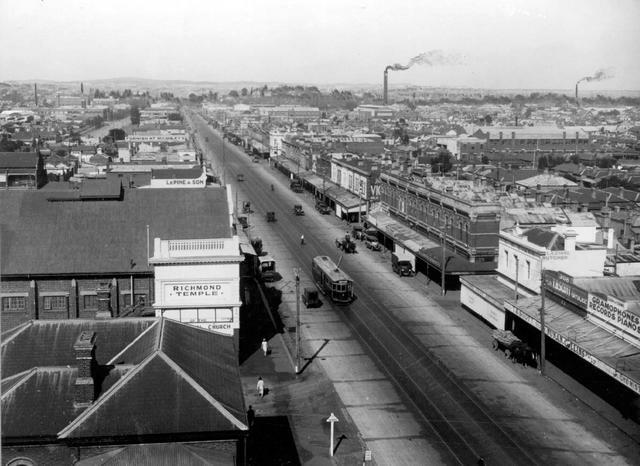 In 1909 James was living at 385 Swan St Richmond with Annie and working as an ironmonger. The descendant of Annie and James also told me that James Cook designed and built the first rail car (tram) in Melbourne. 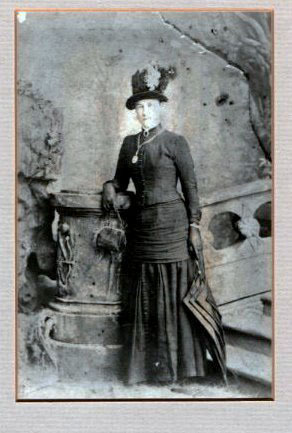 Annie Lord Cook was 45 when James died in 1910. He was 75. James was helping to move a grand piano when he died. 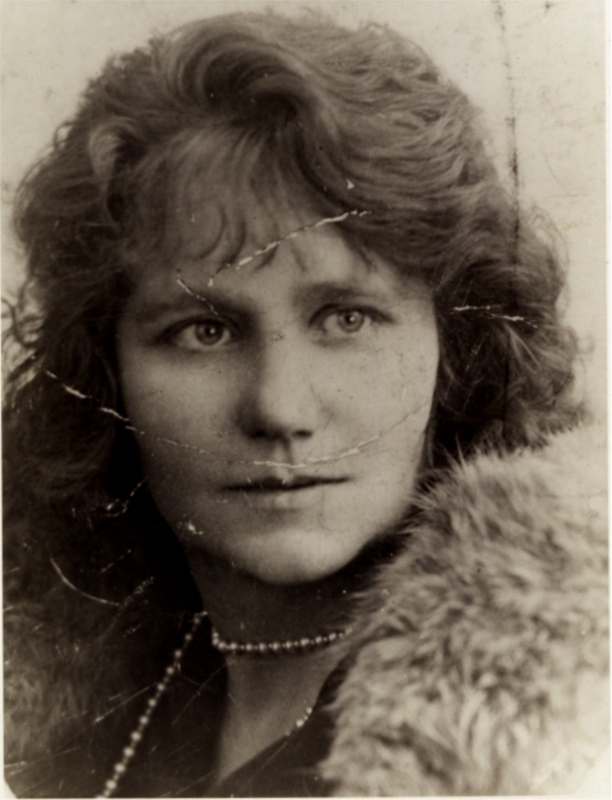 Annie lived at 28 Clyde St St Kilda for the rest of her long life and worked as a charwoman. She died in 1956 aged 89. 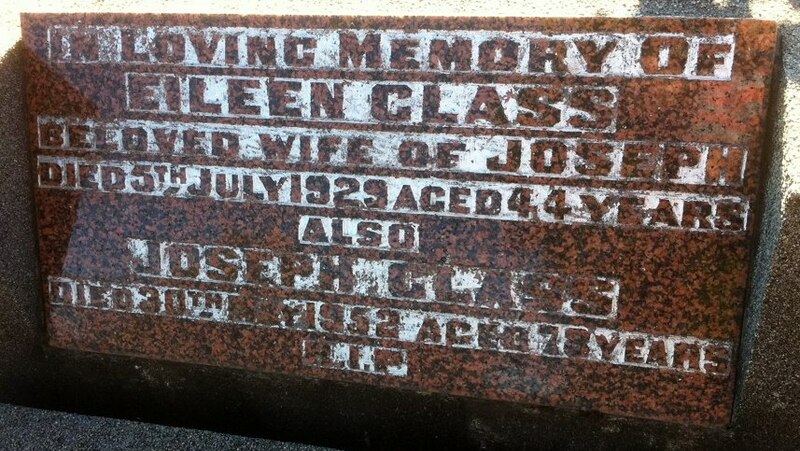 She and James are both buried in Boroondara Cemetery in Kew Melbourne. 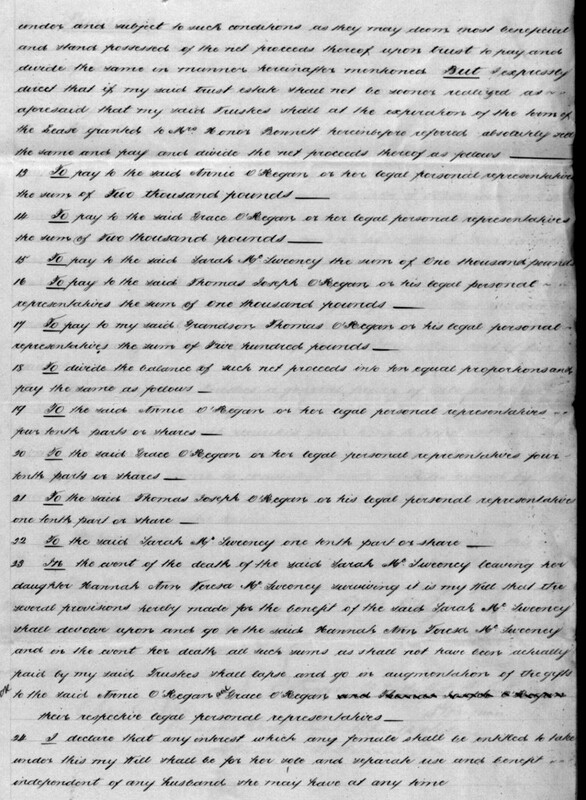 His will and probate papers are online at PROV. The eleven children of Mary Condon and James Eason Cook were Isabella who married William Stanley, George who married Louisa Davie, John, James Thomas, Mary Ann who married Robert Alexander Jones, William, Ellen who married David Carrick Trainer, Alfred Eason married Rebecca Elizabeth Putt, Robert Eason married Annie McSweeney (See McSweeney Family History), Thomas married Amy Annie Drake, and Anna. Robert Eason Cook was my great grandfather. He was born in 1874 at Snapper Point. He was a clerk. In 1893 he married Annie Teresa McSweeney. They had four children: Grace Annie Frances born 2 Nov 1893 in Prahran Melbourne, James Alexander Thomas Eason born also in Prahran in 1896, John Walter Clemont born South Yarra 1901 and a stillborn child born on 18 August 1904. Robert died in Brisbane in 1906. 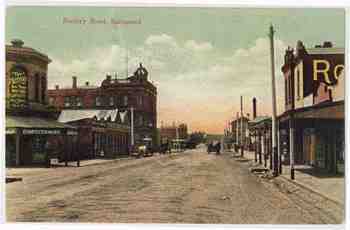 He was working there as an indent clerk and his brother Thomas who was living in Perth WA was also there. 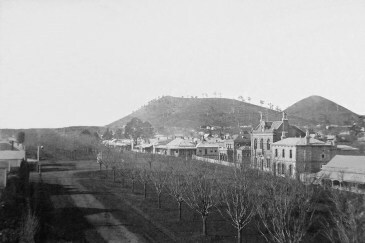 Robert was living in Wickham Terrace. Robert Eason Cook was 32 when he died and was buried in Toowong Cemetery Brisbane Queensland Australia. Annie was with Rupert Owen Croxton Collier, the son of James Lyon Collier, the long time Clunes post master and native of Northamptonshire England. 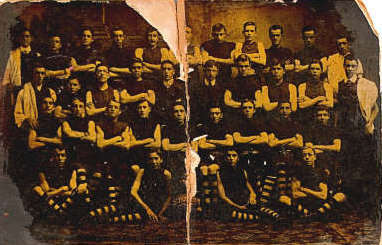 They had five children and married in 1908 in Collingwood Melbourne. 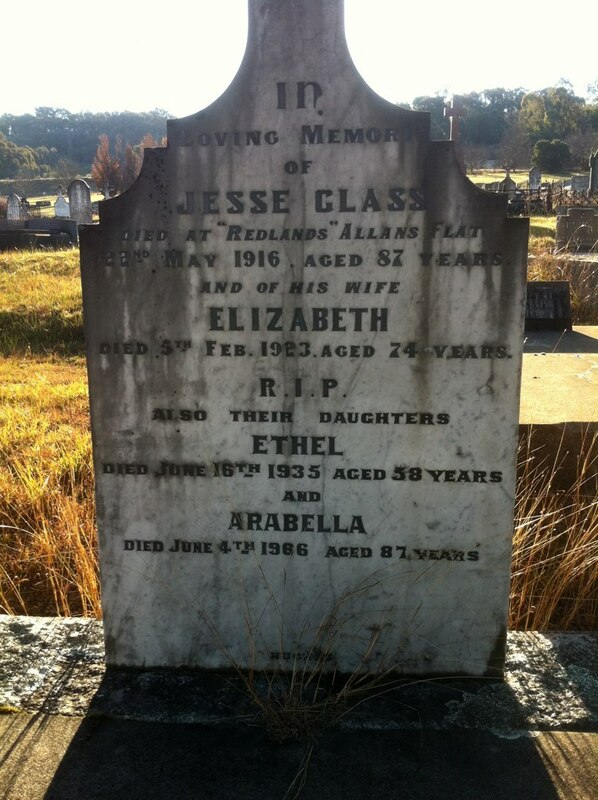 Their first child was born in March 1906 in Bacchus Marsh and Robert Eason Cook died in Sept of that year in Queensland. I think we can assume their marriage had broken down. Rupert Collier died age 37 in 1916 of the Spanish Flu. Annie died three years later of pneumonia aged 46. I remember being told by my grandmother that her parents had died during the Spanish Flu epidemic. 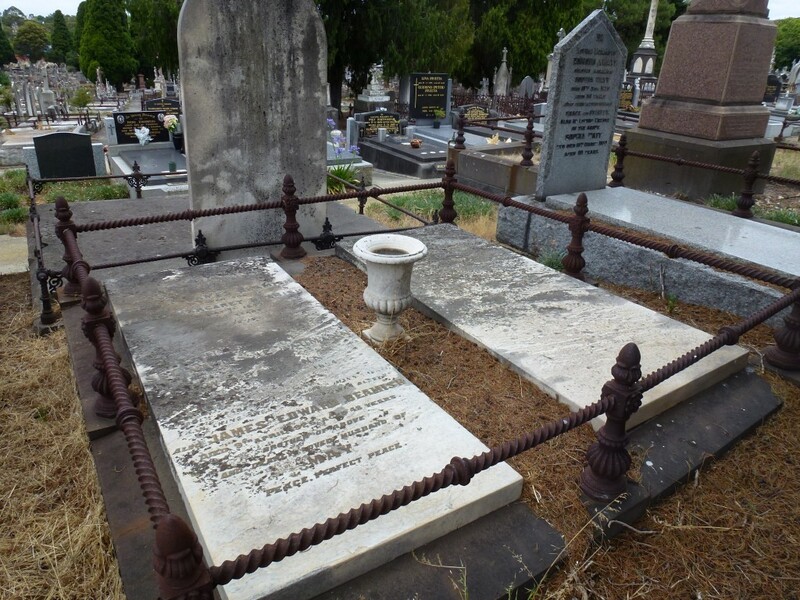 They are buried together in Springvale Cemetery Melbourne. After Annie’s death there were eight children as orphans. I was told some were put in an orphanage. 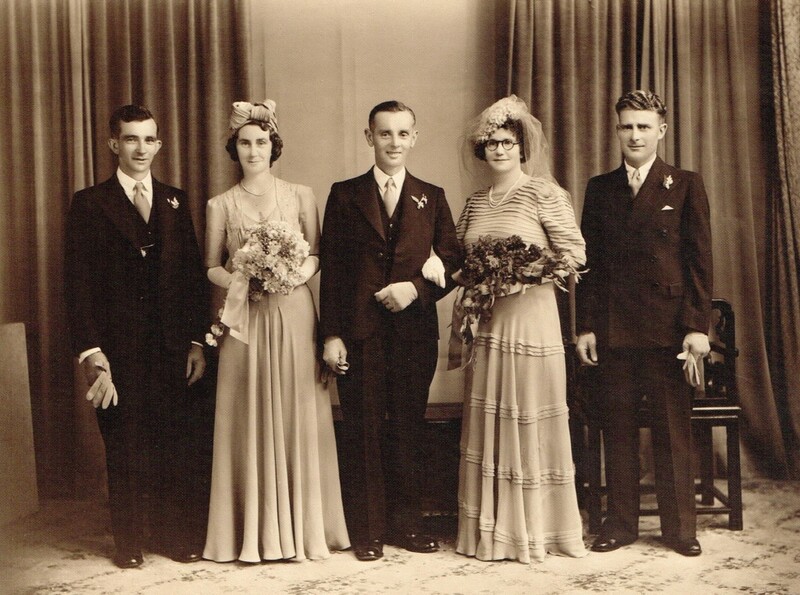 When my grandmother Grace married Ernie Wilson they came to live with her and she raised eleven children all together, including her own four. Grace was married three times. After being married to Ernie Wilson and having three boys to him she met James Knighton and after divorcing Ernie married Jim Knighton. He was my grandfather. They had two children but one was stillborn. Jim left to live with a French woman Juliette and the marriage broke down. In 1941 Grace wanted to remarry and divorced James Knighton to marry a Scottish seaman Arthur White. 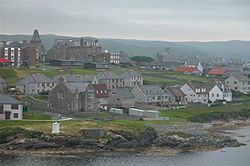 Arthur was born in 1901 in Lerwick the capital of the Shetland Islands, in the very north of Scotland. They were living together in 1943 and 1949 but I was told he went back to Scotland to see his mother. His father was deceased when they married in 1941 he had been a fisherman. His mother’s name was Margaret Watt. I can only assume he didn’t come back. 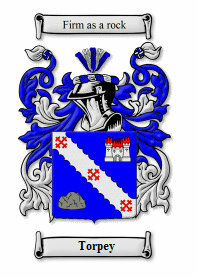 Ann Kilkerry or Kilkeary was my great great great grandmother on my mother’s side of the family. Her surname has many variations in spelling. She married Daniel Torpey. Much more documents and information on Anne Torpey nee Kilkerry can be found under the Torpey Family History. The O’Regans are part of my mother’s family. Thomas Dobbins O’Regan is my ggggrandfather. 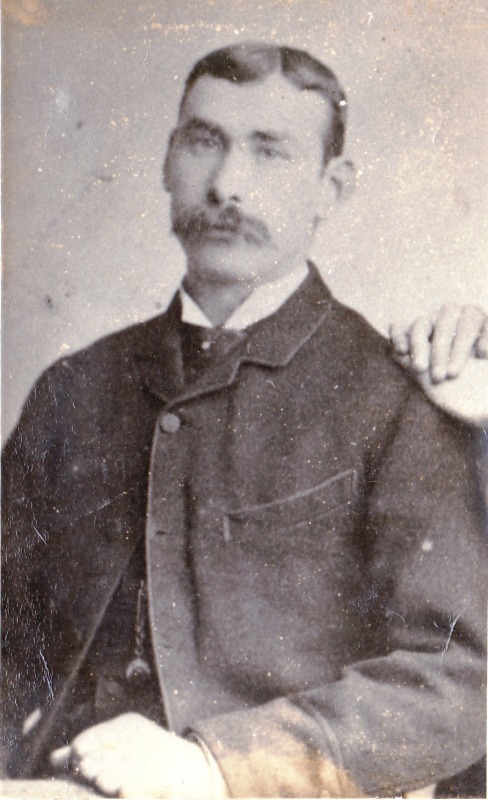 Thomas O’Regan and Grace Dobbins were the parents of Thomas Dobbins O’Regan. On his son Thomas Dobbins O’Regan’s death certificate his father’s occupation was given as teacher. Thomas Dobbins O’Regan was born about 1819 in Co Limerick Ireland. He came out to Tasmania Australia about 1838. He married Johannah Walsh in 1842 in Melbourne Victoria Australia in the Parish of St Francis. At this stage Victoria was a part of NSW. Elenor and Michael McNamara witnessed their marriage. 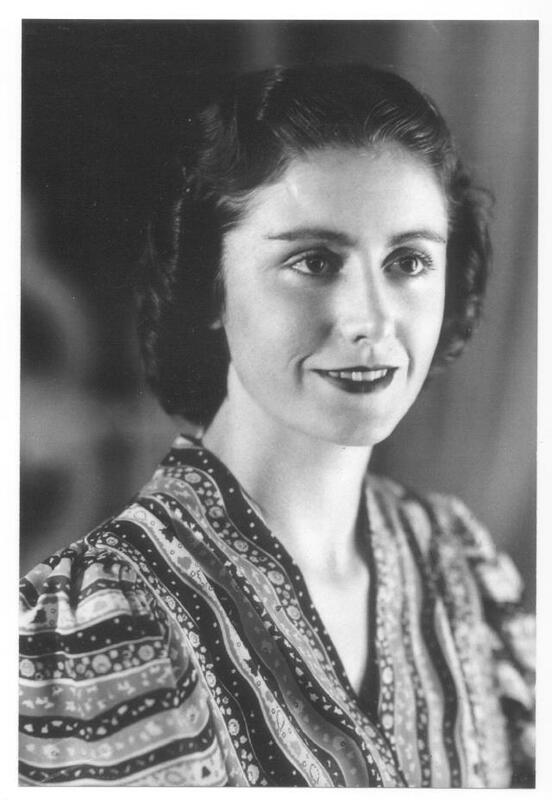 Johannah Walsh was born in Co Cork Ireland and had spent 38 years in Victoria at the time of her death. She must have emigrated about 1840 at age 20. As yet I haven’t been able to find any immigration records for her. Thomas Joseph born 1848 died 1899 in St Kilda Melbourne; John born 1859; Sarah Ann born 1851 South Melbourne and died in Prahran 9 May 1895; Edmond born c1853 died 17 Dec 1876; Annie born c1857; Grace born c1860 and Mary Anne. At the time of Johannah’s death in 1878 Mary Ann, John and Edmund were deceased. Johannah O’Regan nee Walsh died age 58 in 1878. 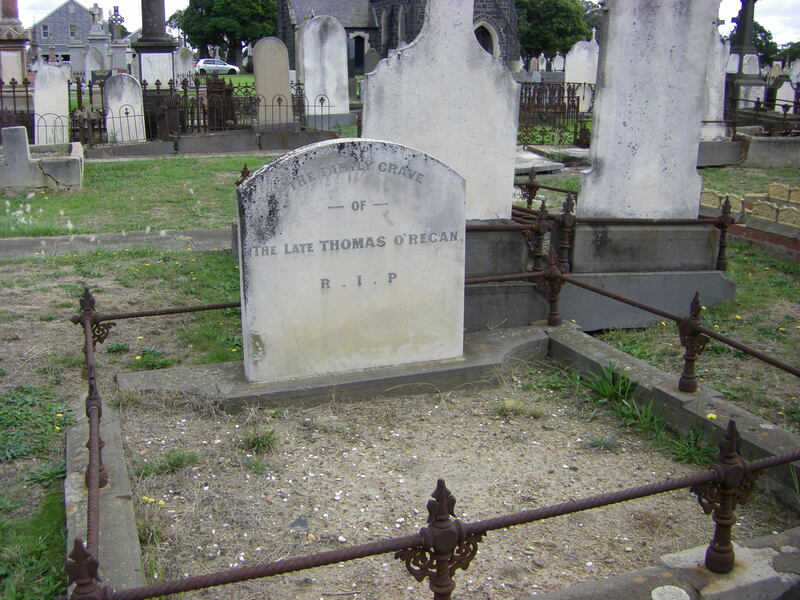 Thomas Dobbins O’Regan died in South Melbourne on 20 May 1888 . His occupation is given as gentleman. He was wealthy and lived off the rent from The Australia Hotel in Bourke St in the center of Melbourne. He spent five years in Tasmania and forty five years in Victoria. He must have came out to Tasmania at about age 19 around 1838. Family stories say he owned a silver mine in Tasmania. He married Johannah Walsh shortly after moving to Victoria in 1842. 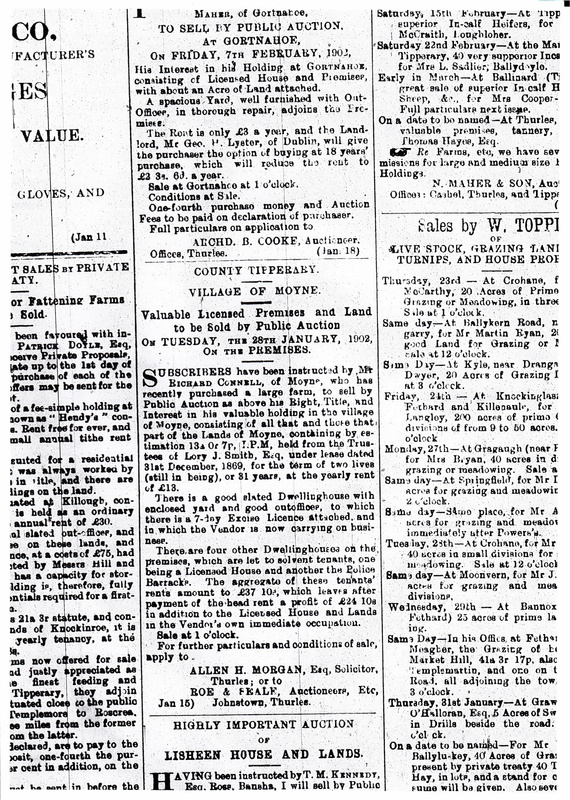 When Thomas Dobbins O’Regan died in 1888 his estate was valued at 14,641 pounds. He was an extremely wealthy man. His marriage certificate has very few details and no occupation. He was listed in The Victoria Post office Directory of 1869 as living in Emerald Hill (South Melbourne) but no occupation. He was in Victoria during the Gold Rush which started in 1851 so he may have made his money then. In the Australia Directory for Port Phillip 1847 Thomas O’Regan is listed as a farrier in Wrights Lane. Wright’s Lane extended from Lonsdale St to Little Bourke Street and was named before 1847 after an early settler. It was later renamed Hardware Lane. 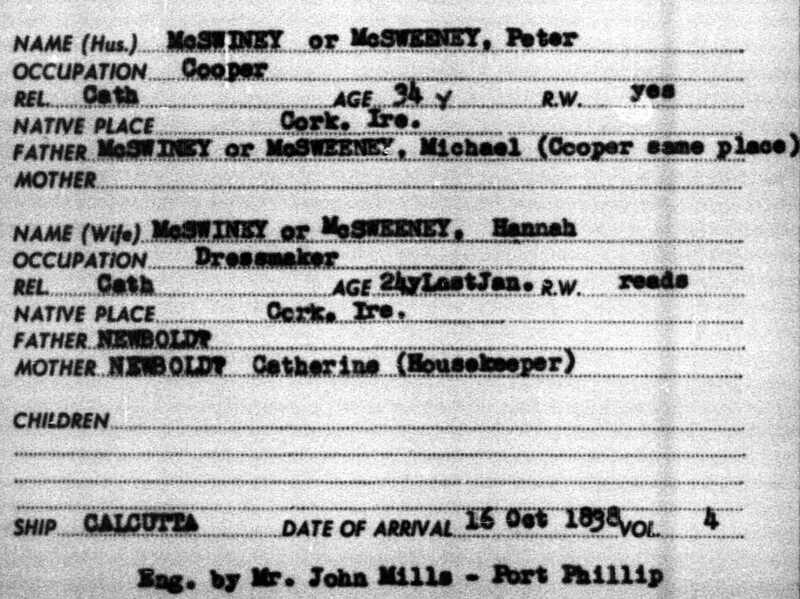 In the same directory is Peter McSweeney (listed as Peter M’Sweeney) a cooper working in Bourke St. Peter McSweeney’s son John Vincent married Thomas O’Regan’s daughter Sarah Ann. The O’Regans and McSweeneys both lived in Emerald Hill in later years, so again there is a connection. In the Electoral Roll for Victoria 1856 Thomas O’Regan, a farrier, is registered to vote. His residence is a freehold and is off Bourke St in Melbourne in St Patrick’s Division. On his daughter Sarah’s marriage certificate 1871 his occupation was given as veterinary surgeon. 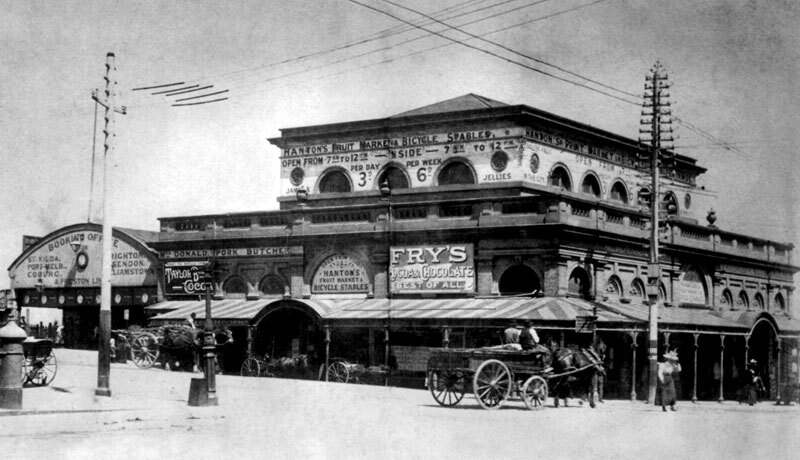 At the time of his death in 1888 he owned The Australia Hotel on Bourke St in the center of Melbourne which returned a rent of 350 pounds annually. It was leased to a Mrs Honor Bennett at the time of his death and valued at 14,000 pounds. Whether he was a publican himself we don’t know. There is no occupation given on his marriage certificate. He lived at 16 Bridport St South Melbourne in 1888 with his unmarried daughters Annie and Grace. He also owned this property which was valued at 650 pounds. 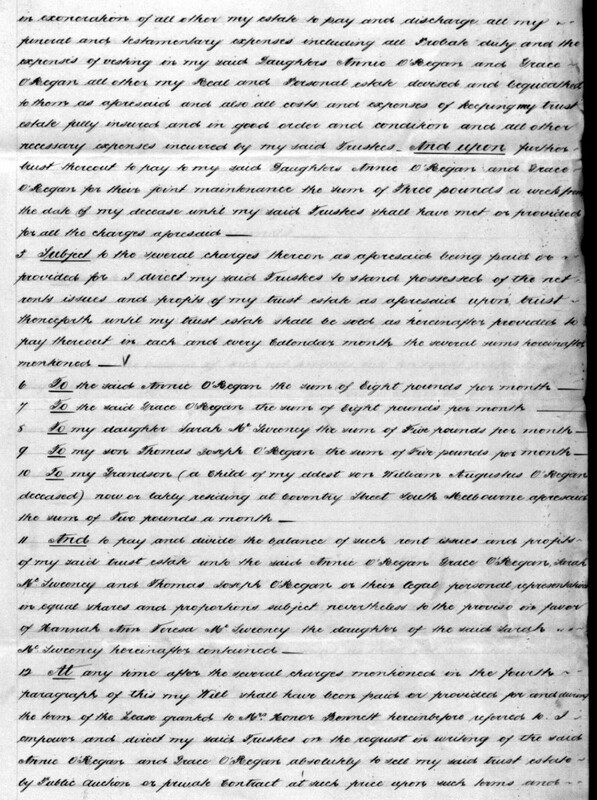 His will which can be seen at PROV Probate and Wills Online. The beneficiaries of his will were his children and two grandchildren. His grandaughter Hannah Ann Teresa McSweeney daughter of Sarah O’Regan was my ggrandmother. She was called Annie. There is much more on the McSweeney family from Co Cork Ireland in this post. 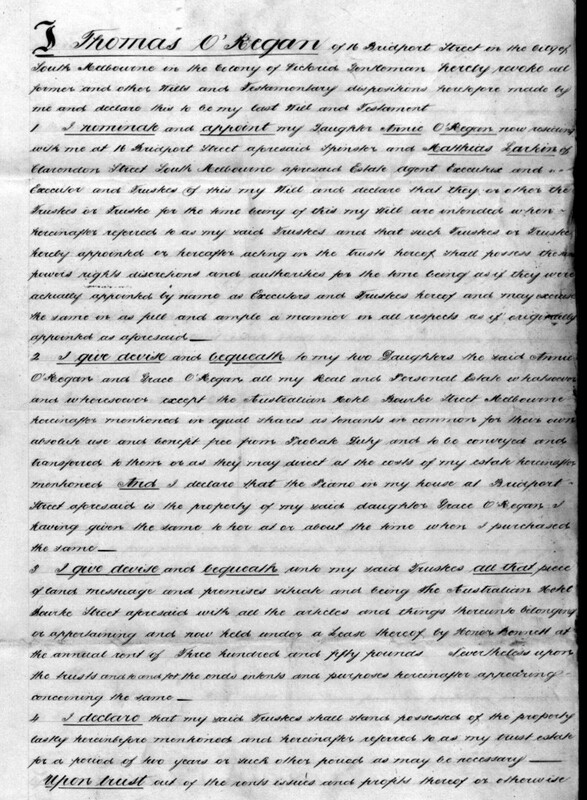 Below is the will of Thomas O’Regan who died in 1888. 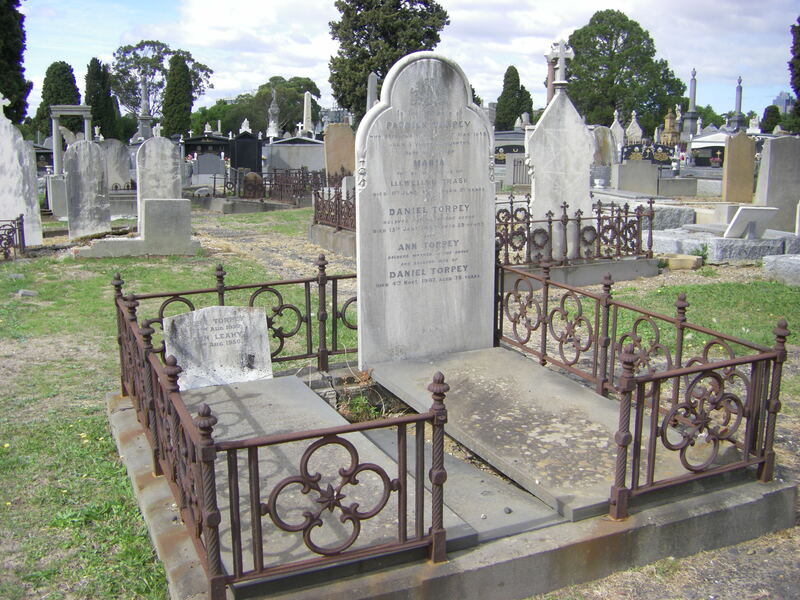 Thomas and Johannah O’Regan were buried in Melbourne General Cemetery. In the O’Regan family grave these members of Thomas Dobbins O’Regan are buried with him. His son Edmund who died in 1876 aged 25, his wife Johanna aged 58 buried Mar 1978. Thomas Dobbins O’Regan himself buried May 1888, Sarah McSweeney his daughter buried May 1895 and his great grand child Babe Cook stillborn buried August 1904. These are all in Compartment D grave no 354. In Compartment D grave 355, which I am assuming is in the same family plot shown in the photo, are buried William A O’Regan aged 38 buried on 5 Sept 1883, Thomas Dobbins O’Regan’s daughters Annie O’Regan aged 56 buried on 24 April 1918 and Grace O’Regan aged 86 buried on 16 Nov 1943. 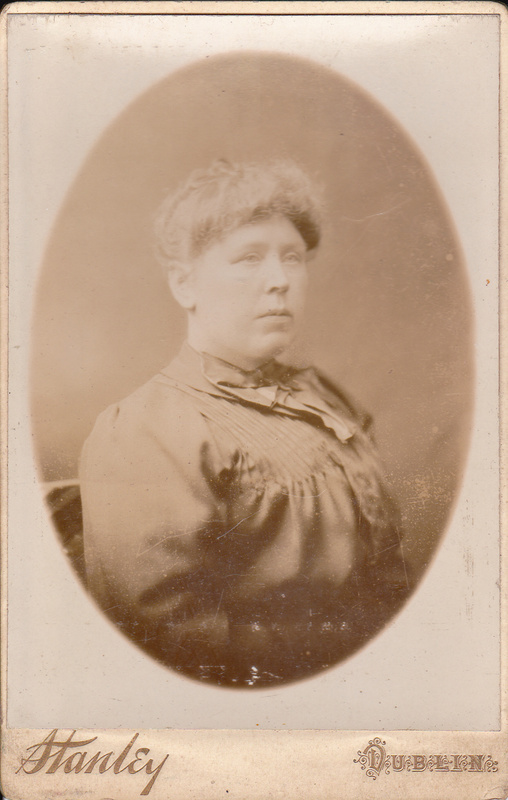 Sarah O’Regan married John Vincent McSweeney, a school teacher, in about 1869 in South Melbourne and they had one child, Annie Teresa in 1872 in Camperdown Victoria. Apparently the birth dates given in census, marriage and death records are often incorrect, as people in the nineteenth century were often unsure of their age and year of birth and so ages were guessed at. Illiteracy and human error could affect the accuracy of all information given on nineteenth century records and especially the recording of names involved. Even by the mid-nineteenth century less than half the population could read or write in Ireland. 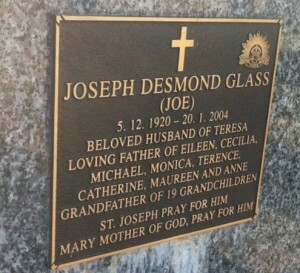 It seems that the priest recording names would not ask the family to spell the name but would guess at the spelling hence the variations in surname within the same family. O’Regan could be recorded as Regan, Reagan, Reaghan, Reygan or Reegan. The prefix O’ was arbitrarily added and dropped on records within families. Also due to the use of the cursive script Regan could be mistakenly transcribed as Rynne, Ryan and Ruane. Dobbins could be recorded as Dobbin, Dobbyn, Dobins or Dubbin. The surname Dobbins and the christian name Grace would be quite unusual in nineteenth century Limerick. It was not possible to find a baptismal record for a Thomas O’Regan born to Grace Dobbins and Thomas O’Regan in Limerick from 1814-1823. 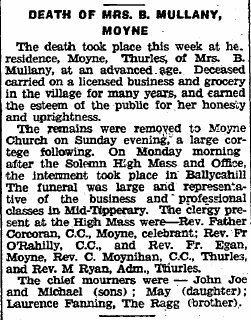 A considerable number of baptisms were not recorded or the O’Regans could have been living in a parish which does not have surviving records for this time. 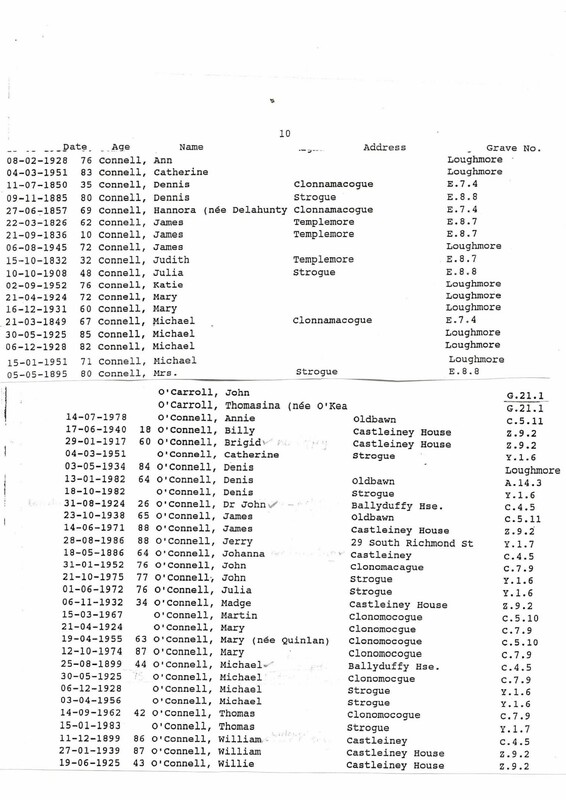 There were also no records found of other children born to a Thomas O’Regan and Grace Dobbins in Co Limerick. 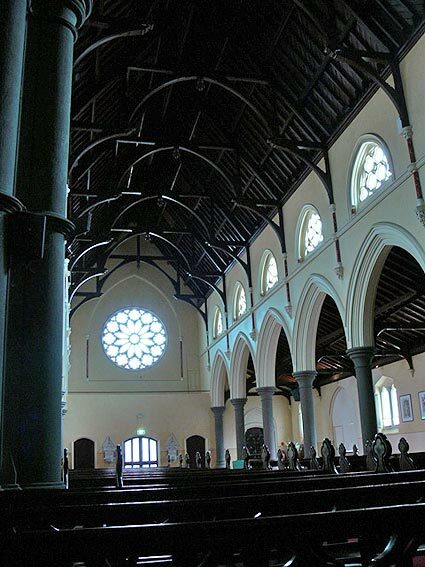 A search for the marriage of a Thomas O’Regan and Grace Dobbins also proved negative but there is a marriage record of a William O’Regan and a Grace Dobbins in Limerick City in 1811 which took place on Wed 3 July 1811 in the Roman Catholic parish of St Mary’s in the Diocese of Limerick in Limerick city. It is possible the priest mistakenly recorded the groom’s christian name as the name Grace Dobbins is so rare in Limerick records. The witnesses to this marriage were named as Mathew Bowin and John Power. The researcher then tried to track Thomas O’Regan senior using the information given on his son’s death certificate that he was a teacher. In Bassett’s Directory of 1884 Limerick city she did come across a Mr O’Regan listed as an arithmetic and calligraphy teacher at the Jesuit’s Sacred heart College at the Crescent. It was not possible to find any baptismal or death records for Thomas O’Regan or Grace Dobbins. According to Wikepedia “Ledwidge is a surname that originated in the hamlet of Upper Ledwyche, Shropshire England. After the Norman invsion of Ireland the family was granted extensive tracts of land by Hugh De Lacy in the counties of Meath and Westmeath. In common with other Old English families many of them took the losing side in the wars of the 17th century and were dispossessed of their lands. The name was spelt in many different ways; the historian Edward Ledwich noted the following variations: Luitwick, Luitwich, Lutwyche, Ledwith, Ledewich, and Ledwich.” Eliza used Ledwich while her two sisters’ surnames were Ledwidge. In the 1640 Down Survey there was a Morris Ledwich in Co Westmeath. Eliza’s brother was called Maurice. Eliza Ledwich was born in Ireland in 1835 and was my great great grandmother. Her mother was Mary Sheil from Castlepollard and her father Michael Ledwich was from Collinstown, also in Westmeath Co. 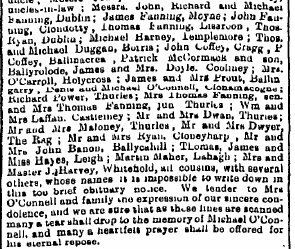 They were married in Castlepollard, Co Westmeath on 6 March 1832. He worked as a bricklayer. 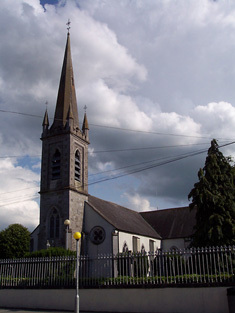 St Michaels Catholic Church Castlepollard Co Westmeath where Michael Ledwich and Mary Shiel were married in 1832. Bessie Ledwidge baptised 4 Mar 1835 in Collinstown. 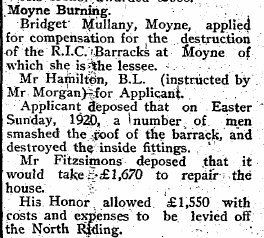 Sponsors were Nicholas Ledwidge and Jane Fagan Bessie being short for Elizabeth or Eliza. I initially discounted these records as I didn’t realise that Eliza was baptised as Bessie. 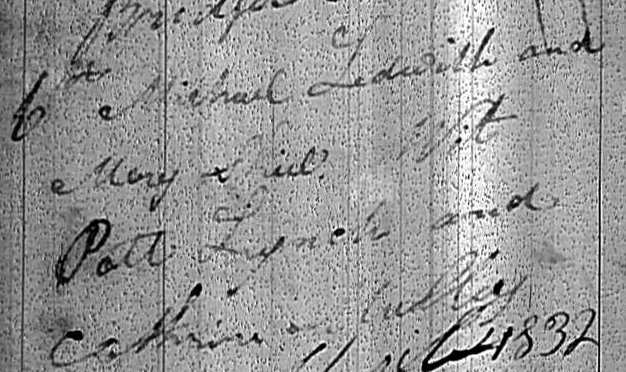 Edward Ledwith baptised 9 Oct 1837 in Collinstown. 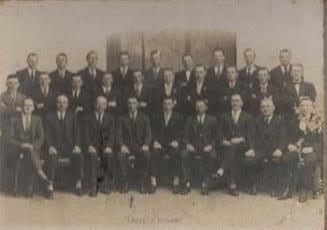 Sponsor was Betty Glennon. 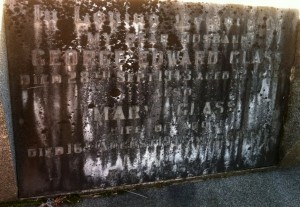 Margaret Ledwidge baptised 17 May 1840 in Collinstown. Sponsor was Margaret Mulrine. Mary Ledwith baptised 11 April 1844 in Collinstown. Sponsor was Mary Casey. estate of the Smythe family. 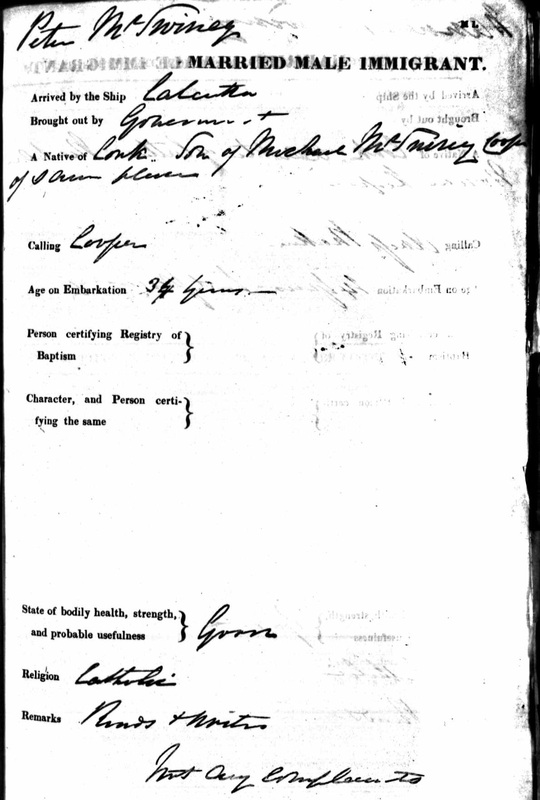 Their family papers have a Michael Ledwidge as William Smyth’s general factotum (a person having many diverse skills and resposibilities) from 1730 to 1759. He played a major part in the building of Barbavilla constructed in c1730. 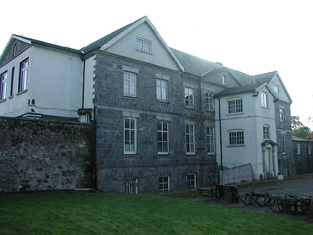 A Mary ledwidge worked for the Smthye family as a housekeeper here at Barbavilla or Dublin. It is possible that this Michael is Eliza’s grandfather. Eliza’s marriage certificate has her being born in Dublin but her death certificate has her coming from Queens Co (Laois). 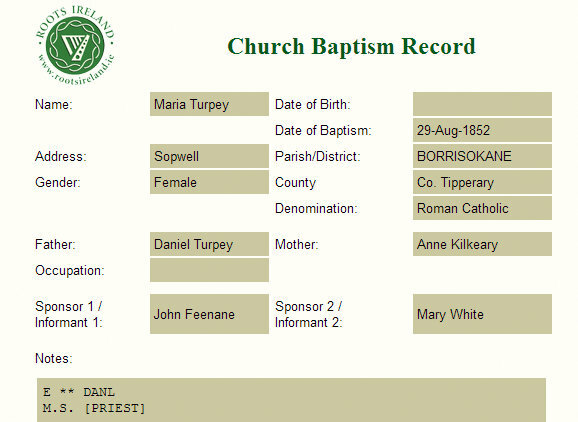 Her Baptism record is from Collinstown in Co Westmeath, 4 Mar 1835. On her Baptism record she is listed as Bessie. 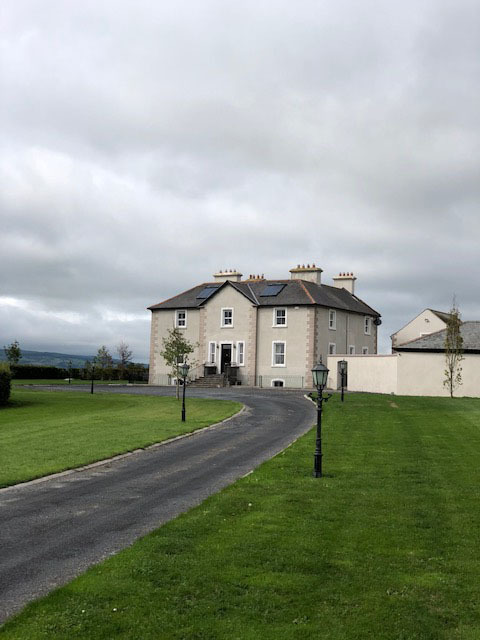 She had four siblings, all born here in Collinstown Co Westmeath. Her two sisters Mary and Margaret came out later to Melbourme and were met by Eliza. The Ledwich children of Michael and Mary Shiel were born between 1832 and 1844. This means that they lived through the devastating Great Famine which lasted from 1845 to 1849. During this time a million people died of disease and hunger and a million emigrated. It is hard to know how the family fared during this time. It seems the girls moved to Dublin before emigrating. Eliza was twenty four, although listed as twenty, when she arrived at Port Phillip and her employer was a Sargent Ellis of Emerald Hill (later to become South Melbourne). She was a general servant and a Catholic. She could not read or write. The majority of the passengers were single women whose fares had been paid by the government. There were 352 females and 28 males and the fare was 13 pounds 7 shillings and 2 pence. There were 5 deaths on the voyage. Gold had been discovered in Victoria in 1851 and huge numbers of migrants had arrived in Victoria to search for gold, in 1840 the population of the colony of Victoria was 10,000. By 1854 it was 123,000. One in four had been born in Ireland. 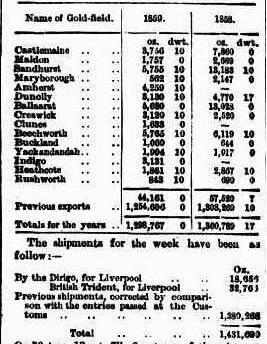 From 1851 to the late 1860’s Victoria’s population nearly tripled. Eliza married James Knighton, a coachman, on March 1 in 1864 at Scotts’ Presbyterian Church Melbourne. Knighton Family History has more pictures and information. Her parents were listed on her marriage certificate as Michael Ledwick, a bricklayer and Mary Shiel. She did not sign her name but made her mark on the certificate. 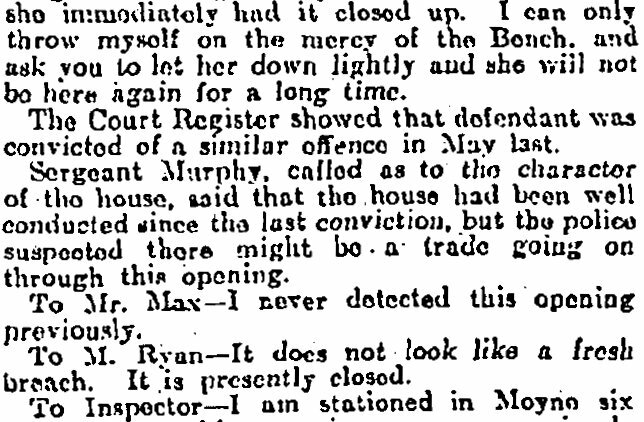 Her occupation was listed as servant and the witnesses were Thomas Reynolds and Mary Ledwidge, her sister. At the time of her marriage she was 22 and James was 26. 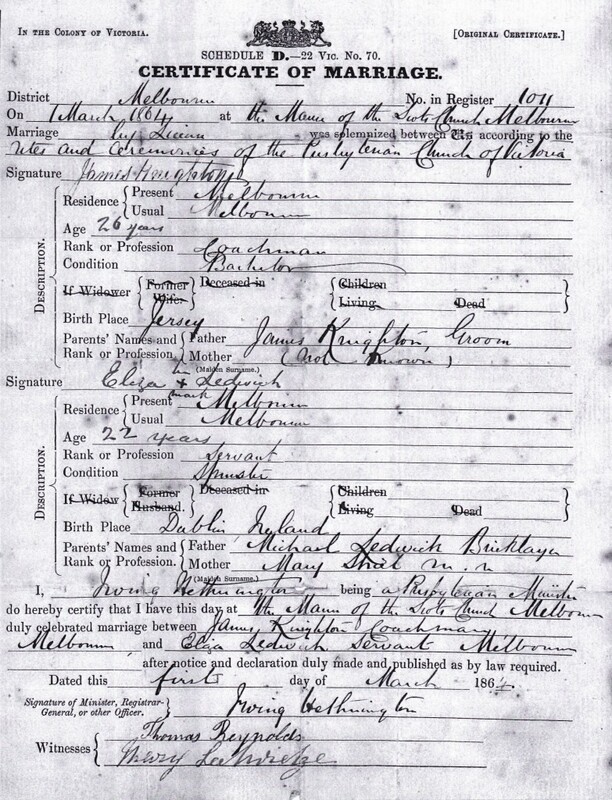 On her marriage certificate her occupation is given as servant and her birth place as Dublin Ireland. Her death certificate however lists Queens Co as her birth place. She had been in the colonies for 52 years. Two children were listed, William 49? and James Edward deceased. Even though she was illiterate Eliza died a wealthy woman. She owned considerable property: Numbers 6,8 and 16 Crown St Richmond as well as 137 and 138 Burnley St in the same suburb. She also owned land at Frankston on the outskirts of Melbourne. Her estate was worth 1,140 pounds. She left 800 pounds to each of her grandchildren, Mary and James. Her son William only got to live in one of her houses rent free for his life. In her will Eliza bequeathed a 100 pound legacy to a Maria Hendy. Maria’s mother Eliza Ross was Irish from Tannaraggan in Co Fermanagh. I have not been able to find Tannaraggan or any place like it in Co Fermanagh. The closest I have come is Tomregan Civil Parish in Grifiths Valuation. This is near Ballyconnell and bordering Co Cavan and there were some Ross folk listed there in 1862. I am getting more convinced that Tomregan Civil parish is where Eliza Ross came from. She was illiterate so would have told a nurse or clerk this is where she came from. 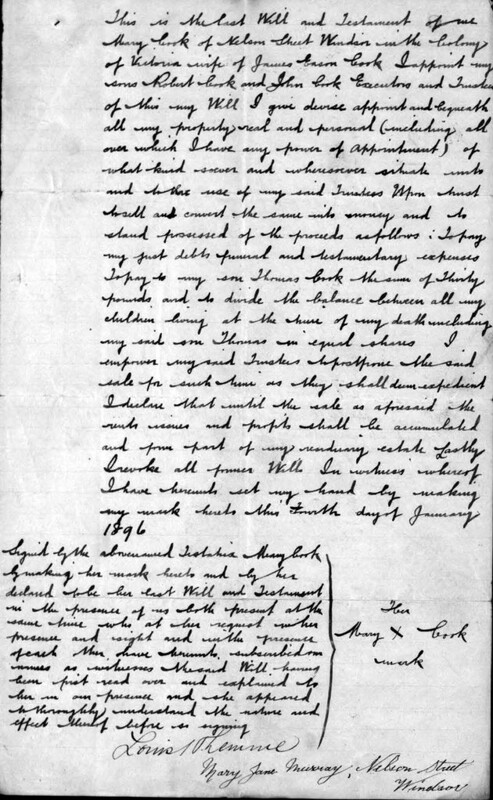 The record of Maris’s birth would have been copied from the patient notes and an “m” can easily be mistaken for”n n”. Looking at the Tithe Applotment entries for Ross in Tomregan the original entries have it spelt Temraggan, which supports my theory. Added to this is a Fermanagh accent and way of pronouncing different parishes and places. In 1827 William, James, John and David Ross were living in Tomregan Parish. Eliza Ross worked as a servant for the Knightons. She fell pregnant with Maria. Maria sometimes signed her name Knighton and at other times Ross. She called one of her sons Frank Knighton Hendy. She lived with the Knightons. 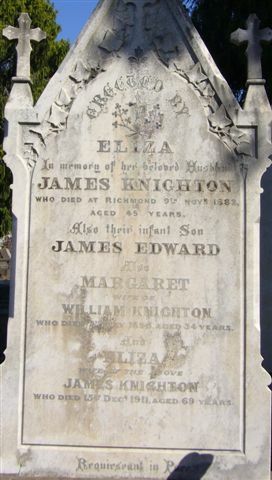 It is not sure if she was a child of James knighton or if she was adopted, Eliza Knighton having lost two babies. Maria was born in 1869 only five years after James and Eliza were married. 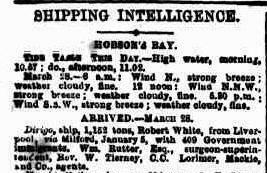 There is a record of an Eliza Ross aged 18 coming out from Liverpool to Melbourne aboard The Southern Empire in Jan 1866. This may have been Maria’s mother. 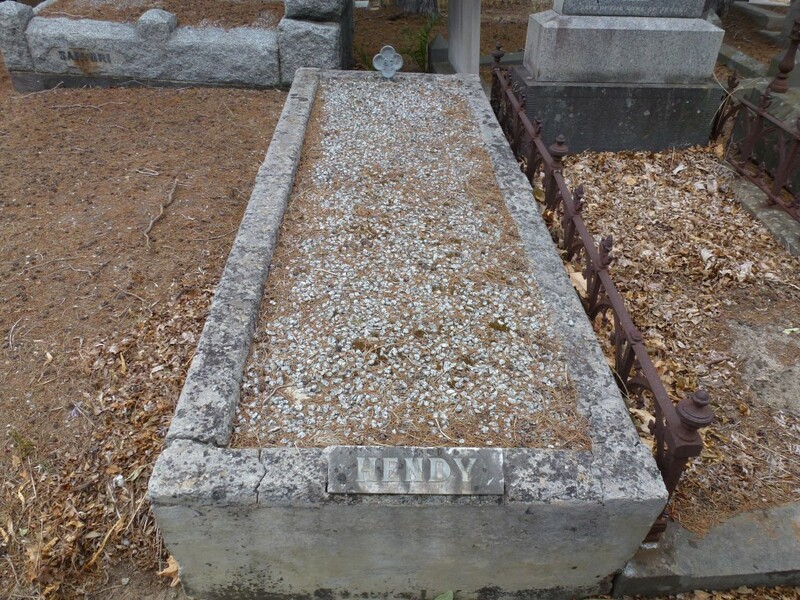 Maria is buried with her husband Robert Hendy in Boroondara Cemetery. Maria was buried on May 26, 1952 aged 82 and Robert buried Mar 6 1928, aged 58. Eliza Knighton nee ledwich is also buried in Boroondara Cemetery Kew Melbourne. Eliza’s sisters Margaret and Mary came out on the Caduceus from Southampton England arriving August 1863 after an 88 day voyage. Margaret was 20 and Mary 17 although on another part of the passenger list Margaret’s age is given as 18. Their occupations were general servants. Both were Catholic. They went straight off the boat to Eliza Ledwidge who was working at 154 Collins St East in Melbourne for a Dr James George Beaney, a surgeon at Melbourne Hospital. 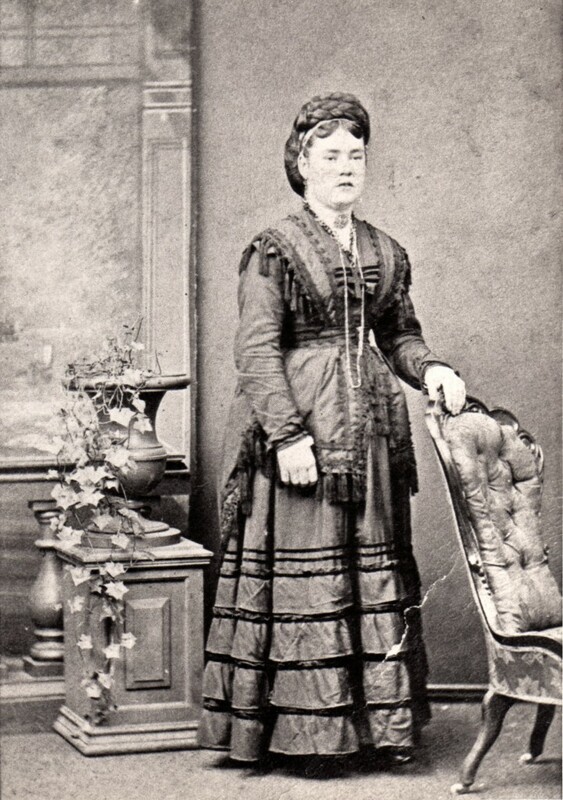 Margaret Theresa Ledwidge, Eliza’s sister, married James Beamish from Coventry England in 1867. 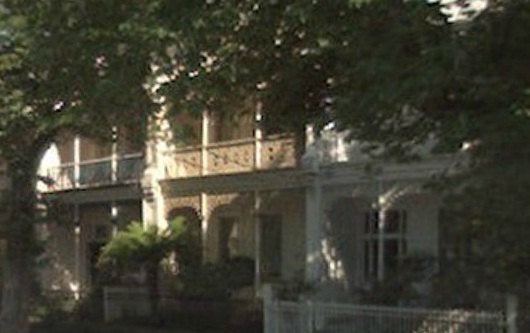 Margaret lived at 35 Burnett St., St Kilda. She died in St Kilda on 19 Dec 1895 and is also buried in Boroondara Cemetery Kew. 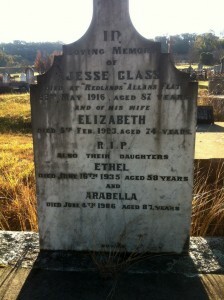 Her husband James had died on 27 June 1895. They are buried in the Baptist section of this cemetery. Margaret Beamish could sign her name unlike Eliza. She also died an extremely wealthy woman in her own right. 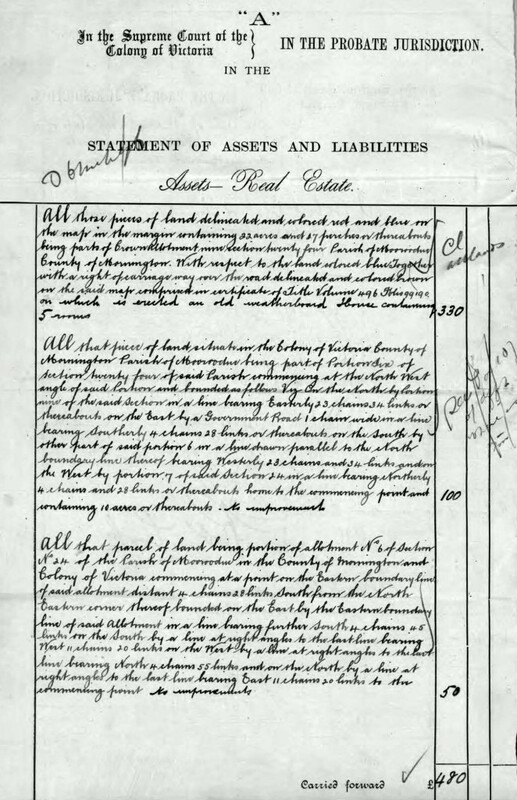 Her estate was worth 3,539 pounds and she owned 101 and 103 Swan St Richmond and two two storey shops and a five storey brick house in Stanley St Richmond as well as a half share with sister Eliza in land at Frankston. In her will dated 1891 she left one pound a week for life to her husband and the rest of her estate was to be divided up among her six children. It is amazing that Eliza and Margaret who were servants when they arrived in the colonies should end up so wealthy. 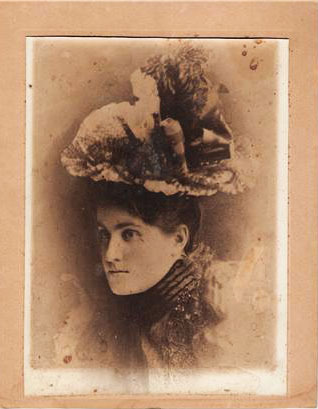 Mary Ledwidge married John Williams in Ulupna, Echuca in 1872. He was born in Tasmania. She was a domestic servant and aged 24. She gave her father’s name as John Ledwidge, a carpenter, and her mother’s name was Mary, surname unknown. She also signed as witness for Margaret Ledwidge at her wedding. Mary died in Queensland in 1926 age 76 years. Both Mary and her husband are buried in Miles General Cemetery in Queensland. Peter McSweeney was the first of this family to come out to Australia. He was born in Co Cork Ireland about 1801 and came to NSW in 1838. He was a cooper. His father Michael McSweeney was described as a master cooper on Peter’s death certificate. The surname was often written as Sweeny and occasionally Swiney. I have been looking at DNA matches to McSweeney. One family who must be related in some way to Peter McSweeney came from Ballytrasna in Kilmurry RC Parish (1901 & 1911 Census Kilmurry). 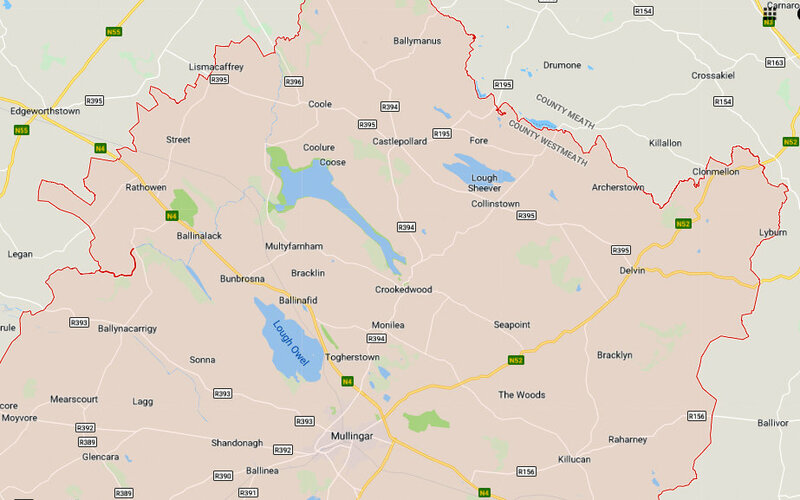 Ballytrasna is on the main road from Cork City to Macroom town. There is a great similarity in first names but I haven’t been able to find a baptism record for Peter. As his father was Michael McSweeney and a master cooper the connection to Ballytrasna is further back. I am however sure there is a common Ballytrasna McSweeney ancestor. In the Griffiths Valuation map below Bryan McSweeney is leasing about 85 acres on lot 3. Peter McSweeney married Hannah Meehan on 7 June 1838 in St Patrick’s Parish Cork City Co Cork Ireland. The witnesses were Joseph and Mary O’Keeffe. The above card is from the records of The Latter Day Saints. Through Ancestry.com I found the passenger lists for the “Calcutta” and some of the information is different. Hannah’s maiden name has always been given as Meehan and I suspect Newboldt is a transcription error. 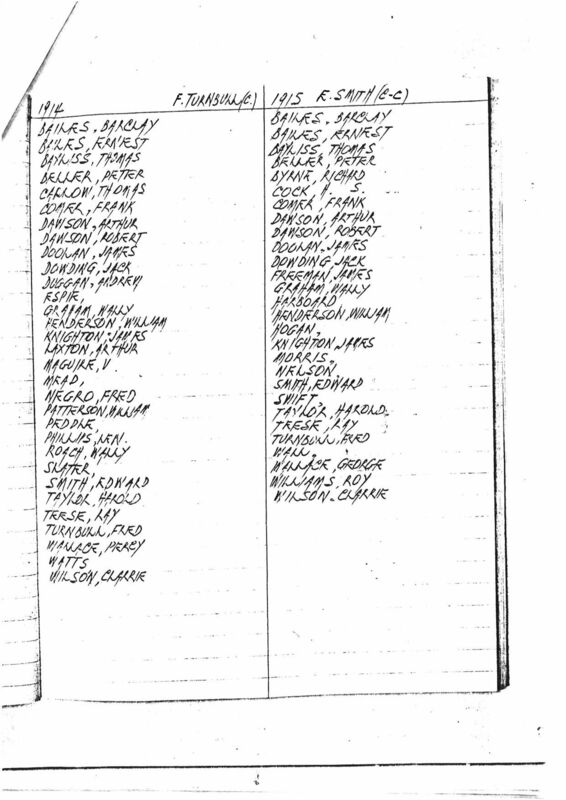 Below are the ship’s list entries for Peter and Hannah McSweeney. The Calcutta’s passengers were all highly skilled bounty immigrants, their fare being 15 pounds each. Their occupations ranged from blacksmiths, plasterers, carpenters to one farmer. There were no laborers on this ship. Peter McSweeney was a cooper. “Traditionally, a cooper is someone who makes wooden staved vessels of a conical form, of greater length than breadth, bound together with hoops and possessing flat ends or heads. Examples of a cooper’s work include but are not limited to casks, barrels, buckets, tubs, butter churns, hogsheads, firkins, tierces, rundlets, puncheons, pipes, tuns, butts, pins and breakers. He married Hannah Meehan in Cork City in St Patrick’s Catholic Parish on & Jun 1838. They had seven children in Australia: Mary, Catherine, John, John Vincent, Eugene and Hannah. They lived in Emerald Hill now called South Melbourne. The Australia Directory for Port Phillip 1847 has him listed as Peter M’Sweeney a cooper in Bourke St Melbourne. In the 1866 Victoria Post Office Directory he was living at Three-chain Rd Emerald Hill. The 1869 Post Office Directory of Victoria has him listed as a cooper in Emerald Hill. He owned some property and in his will he is described as a gentleman. His estate was valued at 788 pounds. 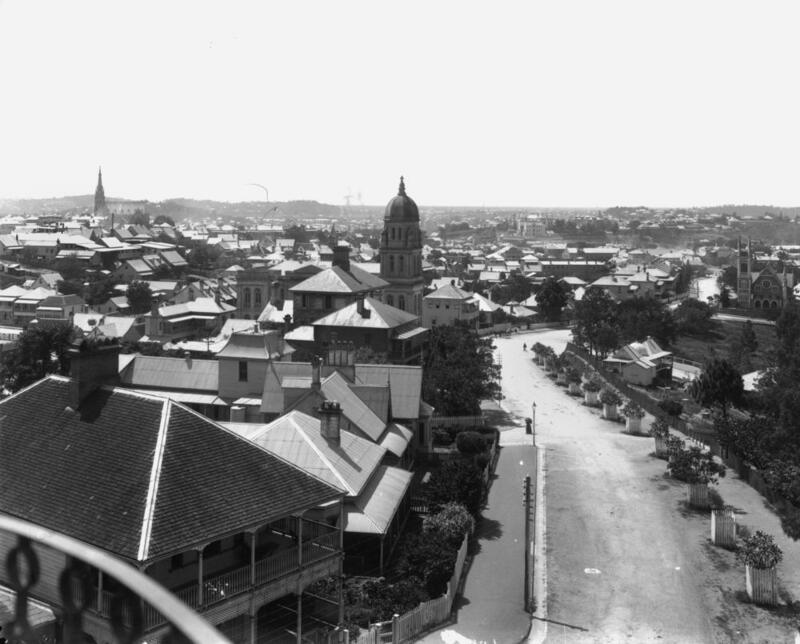 He owned land in Bridport St Emerald Hill and also two two storey houses of six rooms each. He also owned land in Gold St Collingwood and a four room cottage 17 Albert Rd Emerald Hill. Peter McSweeney died on 7 Mar 1872, aged 70. He resided at 17 Albert Rd. 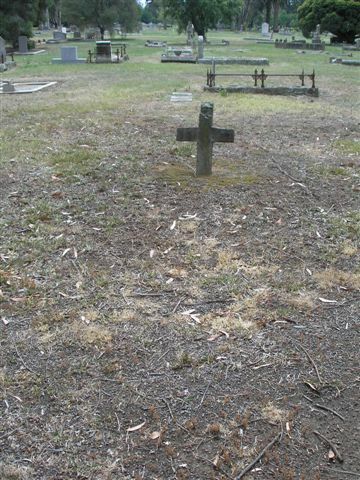 South Melbourne and is buried in Melbourne Cemetery. In his will Peter McSweeney left his two houses in Bridport St South Melbourne to his daughter Hannah. His wife Hannah died the same year shortly after her husband. In Hannah’s will five living children are mentioned, Mary married to Frederick Pearce, James, Catherine, John and Hannah. So it appears that Eugene is deceased by 1872 and perhaps Micheal James is being called James. Money is given to John Vincent, Mary and Hannah. Michael James, Catherine and Eugene are not included. 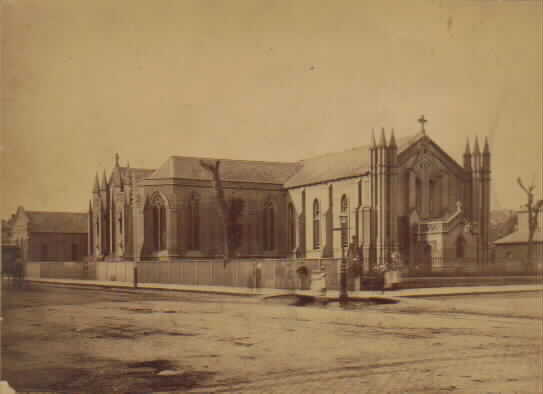 Their son John Vincent McSweeney married my gggrandmother Sarah Ann O’Regan on June 4 1871 at St Peters and Pauls Catholic Church in Emerald Hill. She was 19 and John 21 and a teacher. Sarah McSweeney nee O’Regan died of breast cancer in 1895 she was 43 years old. 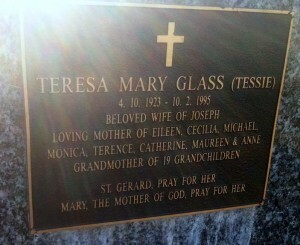 She is buried in Melbourne Cemetery with other O’Regan family members. 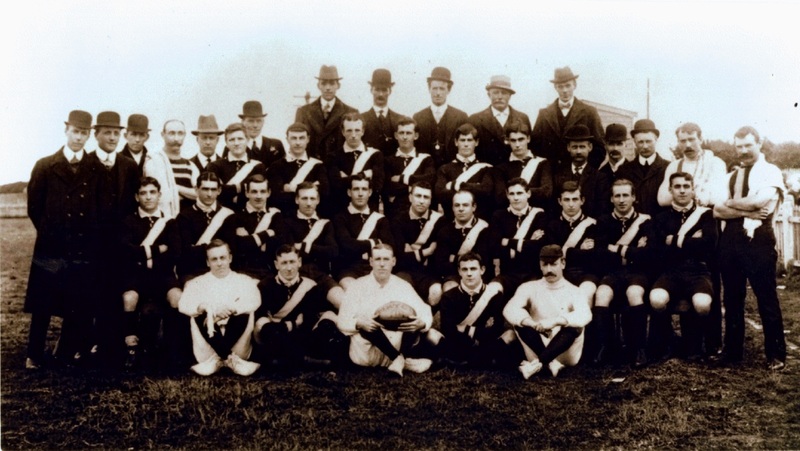 There is much more on the O’Regan family in O’Regan Family History from Limerick to Emerald Hill Melbourne. 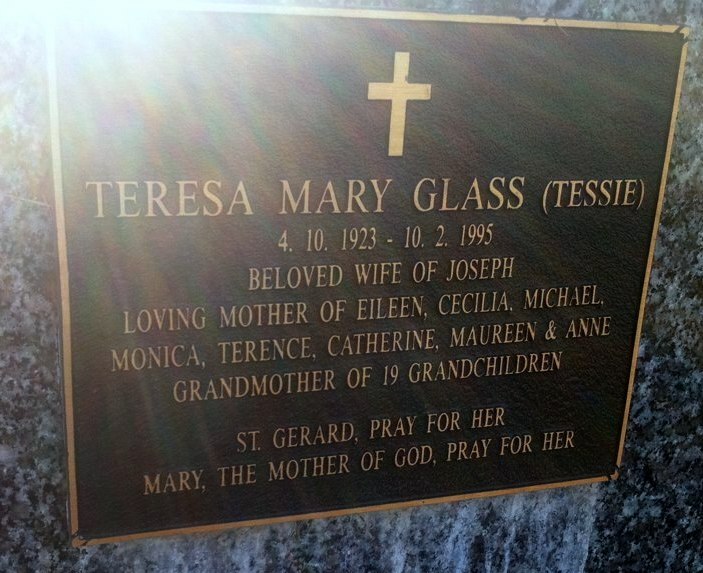 They had one child Ann Teresa in 1872 in Camperdown Victoria in the Western District between Geelong and Warnambool. She was often called Hannah although she later called herself Annie. John Vincent McSweeney died in 1916 at age 68. June 1871 marries Sarah O’Regan. He is 20 and a school teacher and resides in Emerald Hill. 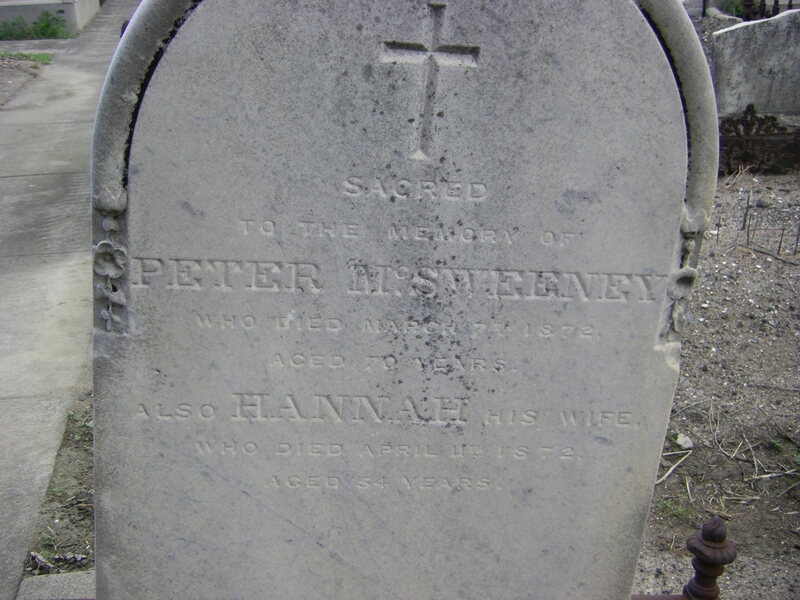 7 March 1872 His father Peter McSweeney dies. 4 April 1872 Birth of daughter in Camperdown Victoria Teacher residing in Camperdown. 11 April 1872 His mother dies. John Vincent McSweeney is residing at Purrumbete Camperdown. 21 August 1888 In his father-in-laws will Sarah his wife is living at Blessington St St Kilda and he is described as from Sydney NSW. 1893 daughter Annie marries Robert Eason Cook. 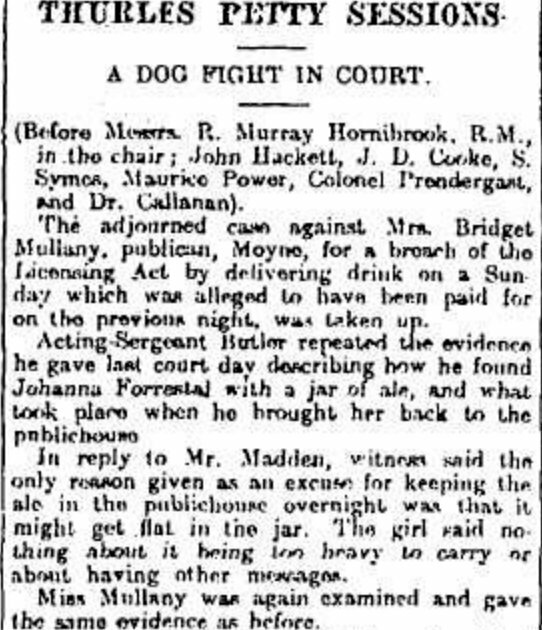 She lives at Inkerman St St Kilda and her father John Vincent McSweeney is described as a gentleman. 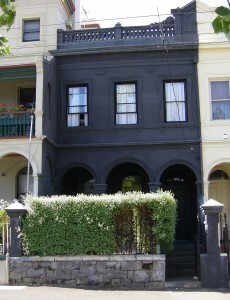 1895 Wife Sarah dies at 101 Union St Prahran where his daughter and her husband are living. On her death certificate Sarah is listed as living 2 years in Qld, 2 years in NSW and 39 years in Victoria. 1908 Daughter Annie marries for the second time, to Rupert Collier. Her father’s occupation was listed as civil engineer. 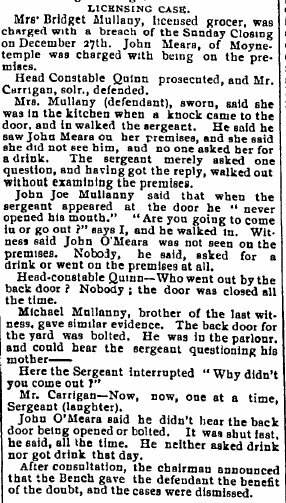 Sept 1916 John Vincent McSweeney died at 8 Woodside St Fitzroy. His occupation given as school teacher. 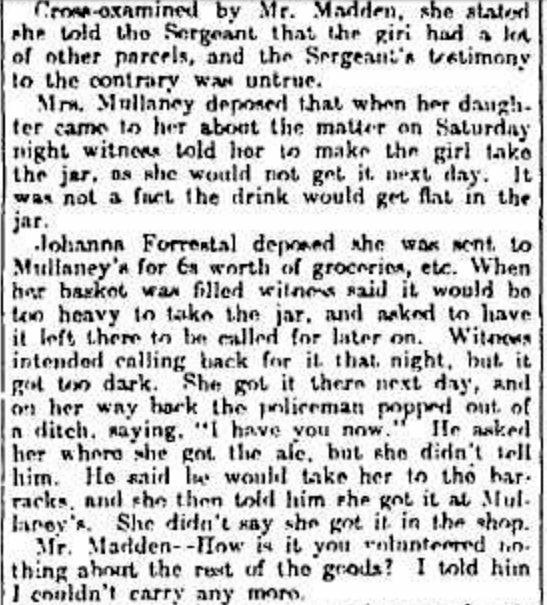 April 1919 His Annie daughter dies. His occupation was listed as civil engineer. It seems that he spent some time in Qld and NSW but I can find no trace of him in electoral rolls, newspapers or teacher’s records. Strange that he wasn’t registered to vote. Their daughter Annie McSweeney married Robert Eason Cook in Armadale in Melbourne on 24 Jan 1893. He was 19 and a law clerk and Annie was 20. Annie is my great grandmother on my mother’s side. 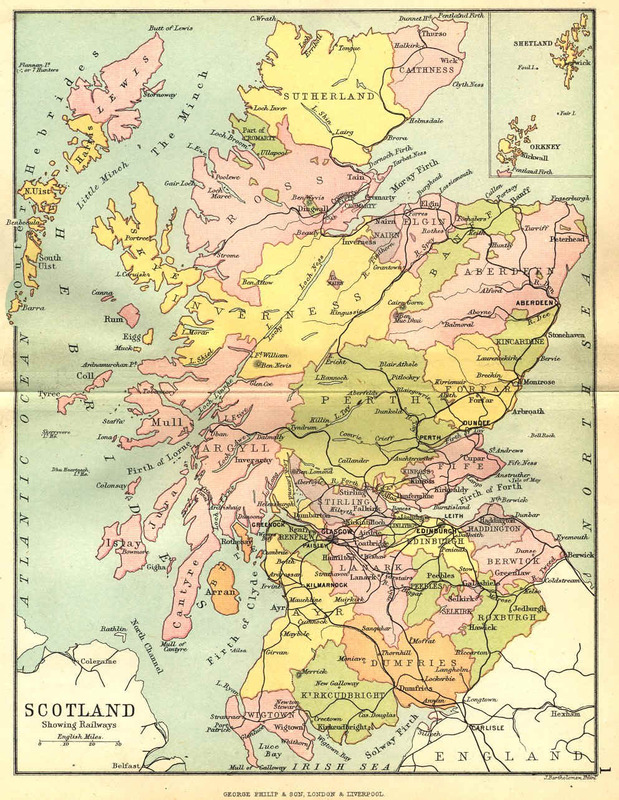 The Scottish ancestry of the Cook family is covered in another post Easson Family History. 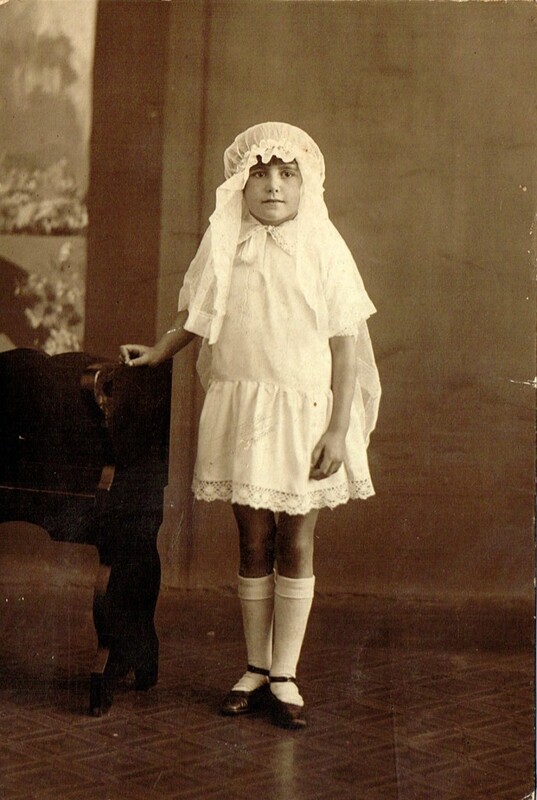 They had four children: Grace Annie Francis born in 1893 in Prahran, my grandmother; James Alexander Thomas Eason born 1896; John Walter Clemont born 1901 and a stillborn child born in 1904. Their marriage broke down at some stage and Annie married Rupert Owen Croxton Collier. (What I have on the Collier family is in another post still in draft, Collier Family History.) She had a child to Rupert Collier while still married to Robert Cook. Robert Eason Cook died suddenly at age 34 in Brisbane Queensland. What he was doing there is unknown. His occupation was given as indent clerk. The informant on his death certificate was his brother Thomas Cook who usually resided in Perth Western Australia. What they were both doing in Brisbane at this time is a mystery. 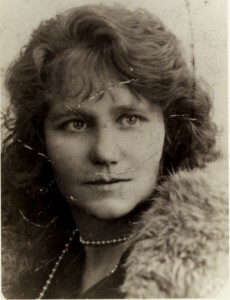 Rupert and Annie had five children: Esther Helena in 1906; Winifred Mary in 1908; Inez Lorna c1911; Rupert Croxton c1913 and Nellie Constance in 1914. I can remember being told that my great grandparents died in the Spanish Flu Epidemic 1918-1919 after the Second World War in which about 12,500 Australians died. Rupert Collier died in 1916 of broncho pneumonia aged 36 and Annie died in April 1919 age 43 from influenza, her youngest child was 4 years old. She left three Cook children, my grandmother Grace being the eldest and at the time of her mother’s death. From her second marriage to Rupert Collier she left five children. 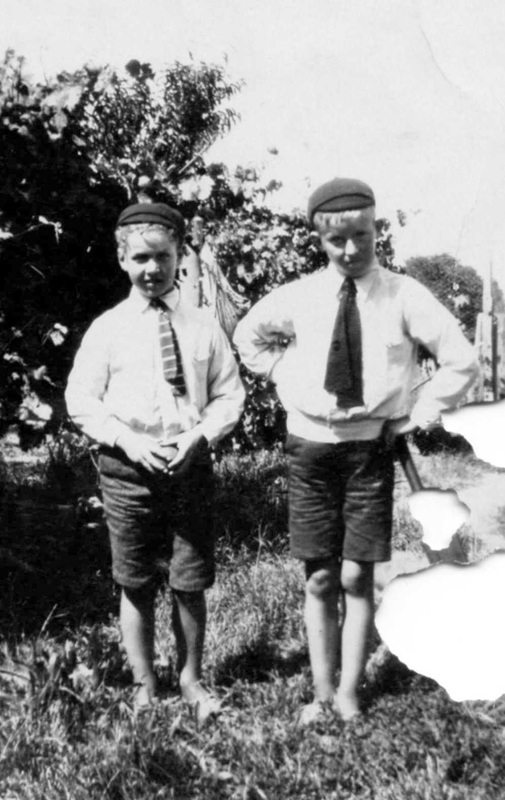 I was told by my grandmother that the younger children by Rupert Collier were put in an orphanage and after my grandmother married Ernie Wilson she looked after them all along with her own children, a total of eleven children. 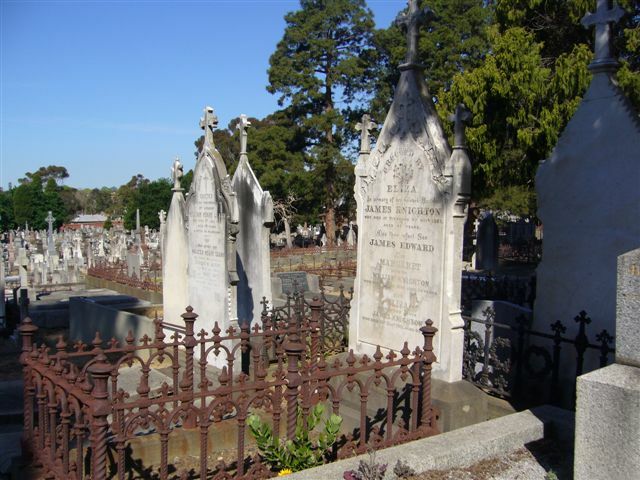 Annie is buried in Springvale cemetery Melbourne with her second husband Rupert Collier. My maternal grandmother told me we had Irish, English and Scottish ancestors. The Torpeys, the O’Regans and the McSweeneys were Irish, the Knightons were English and the Cooks were Scottish. On my father’s side I always knew that his ggrandfather, William Patrick Fanning, Big Bill, came out to Australia on the Enmore in 1841 and eventually settled at Bulla north of Melbourne. I was lucky enough to know that he came from Thurles in North Tipperary. The Fannings rented land and were relatively well off, so have been easier to track than the other branches of my family. They were mostly farmers but some were shopkeepers and publicans. This has meant I have been able to find them in directories and other documents. I knew that Daniel Torpey came from Kings county, his wife from Queens county, and their first child, Maria, was born in Sopwell Co Tipperary. 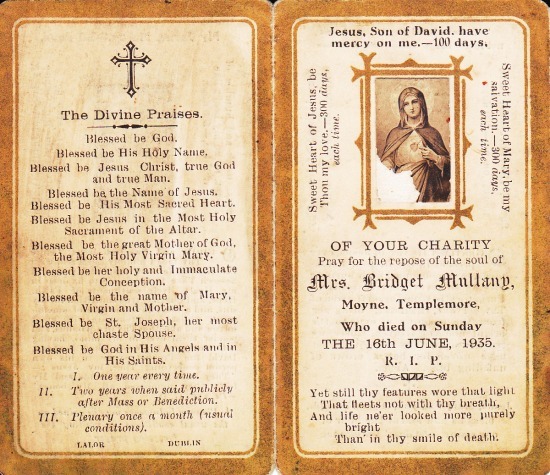 Maria was baptised on 29 August 1852 in Borrisokane parish. As with most Irish surnames they were spelt phonetically and in different ways. The most common spelling is Torpey and Torpy. But I have come across Torpie, Turpey, Tarpey, Tarpy, Thorpe, Torphy, Turphey and Torphey. It just depended on how the person writing the record thought the surname should be spelt. 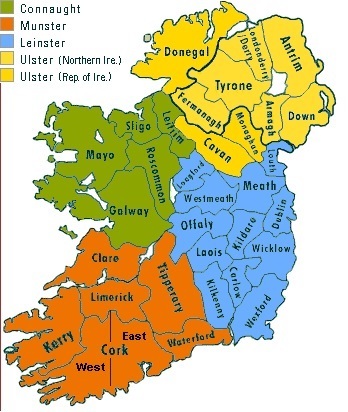 Kilkeary was also spelt in a variety of ways from Kilkeary to Kilcary to Kilkerry to Killcary. I have recently done some searching for Kilkeary records. In the Tithe Applotment books there was a Roger Kilkeary in Sopwell townland about 1824. In Griffiths Valuations all the Kilkearys were in one area of Ireland in North Tipperary, up in the northern most area around Borrisokane. 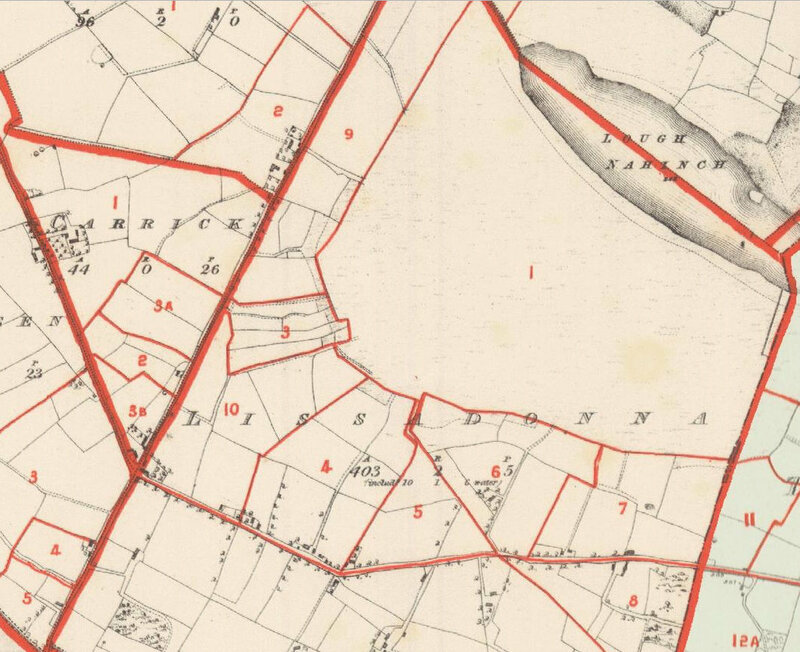 However in the townland of Sopwell there were no Kilkearys or Torpeys in 1851. However there were lots of Torpeys in Tipperary and surrounding counties. I think it is more than likely that Sopwell was where Ann Kilkeary was born and raised. I did come across a baptismal record for an Anne Kilkeary born Sopwell, Borrisokane, 15 Nov 1823. Mother was Catherine Nolan but the father was Roger Kilkeary. On Ann’s death certificate her father was listed as John but this could easily have been a mistake although none of her sons was named Roger but one son was named John. I have also read that the Torpeys were actually of older Irish stock than the Anglo-Norman Fanning family. The name Torpey is an Anglecized form of the Gaelic O Tarpaigh. Tarpey and O’Tarpey, O’Torpey are all variations on the surname. 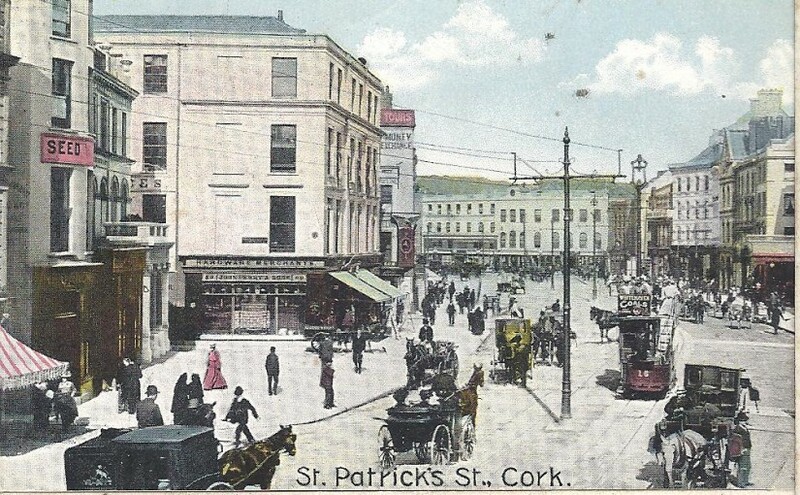 They held a family seat in Cork and are said to be descended from the ancient tribe of Erainn stock. The O’Tarpeys were also associated with Sligo Co. I also did an Ancestry DNA test and a match came up for me for a Margaret Cavanagh nee Torpey. This has led me to find the home and townland, Lissadonna, in Co Tipperary, that Daniel Torpey my gggrandfather came from!! Unfortunately the baptismal records for Daniel and his siblings were in the Parish records for Shinrone Parish. All church records earlier than 1843 have been lost or destroyed. 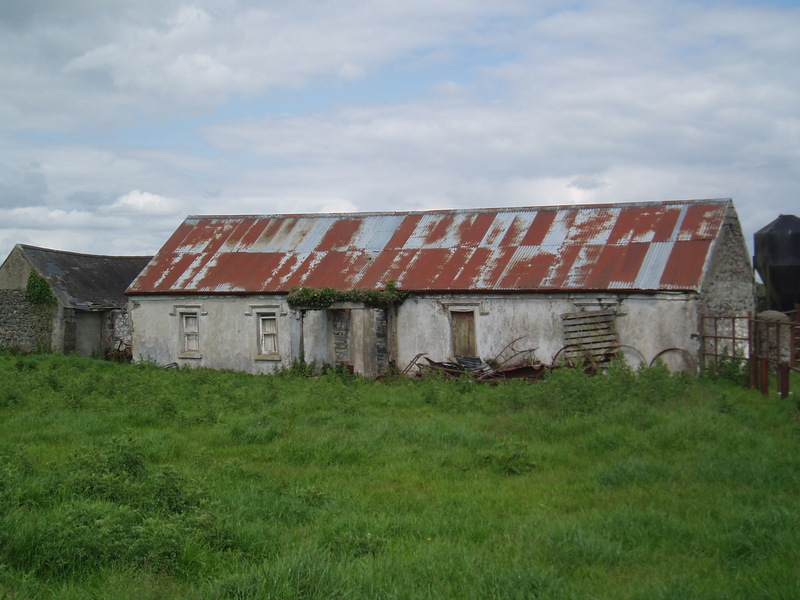 In the Tithe Applotment Books 1823-1837 a Daniel and a Michael Torpy are separately listed as living in the townland of Carrig Lisadona & Boston, in the Parish of Ballingarry in Co Tipperary. They are listed in 1831 and 1834. 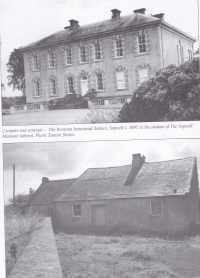 In 1834 Daniel has three acres of second class land and three acres of third class. Michael has a little over one acre of second class land. A Patrick Kilkeary is also listed in this townland. 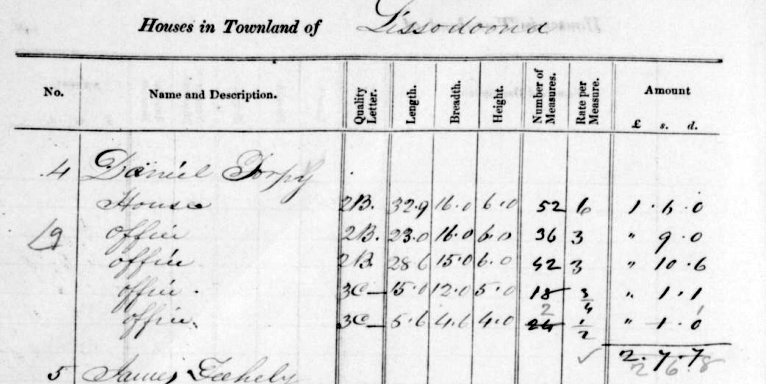 In the 1841 Census Dan Torpy is living in the townland of Lissadonna in Ballingarry Parish Co Tipperary. In the Valuation Office Books, 1831-1856 Daniel Torpy is living in Lissadonna in 1846 and 1848. 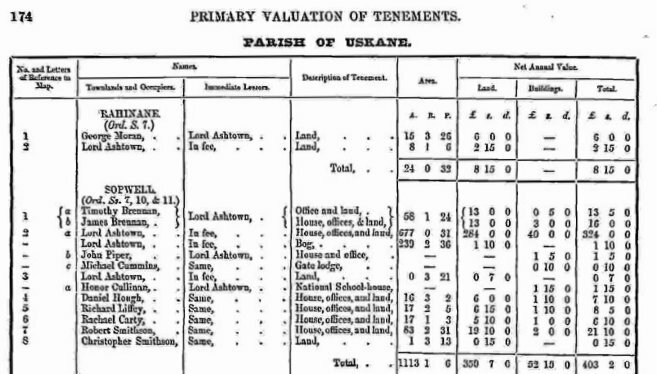 Daniel Torphy appears in Griffiths Valuation records about 1852 in Lissadonna. He has a house, offices and 17 acres of land. Michael Torpey does not appear again and may have been Daniel’s father deceased or brother. 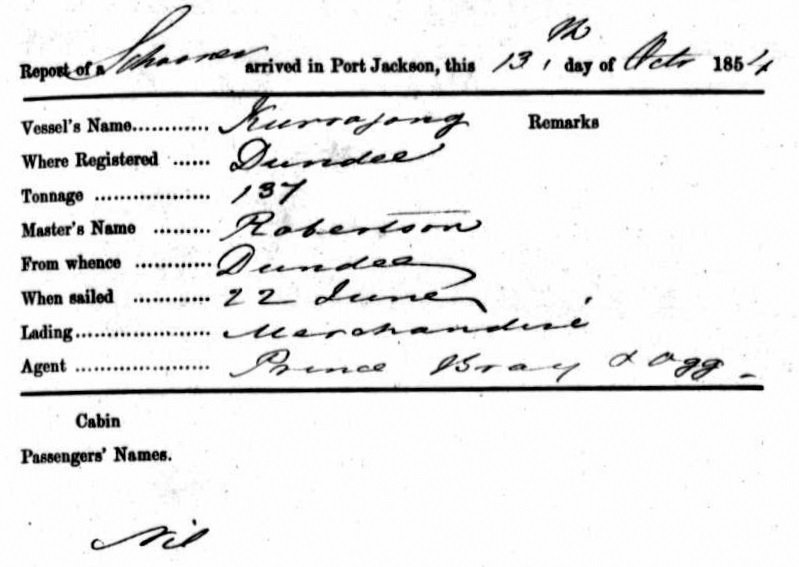 I pick up the trail of the Lissadonna Torpeys in the 1901 Census. Michael and Mary Torpey are at House 2 in Lissadonna. There gransson Richard Liffey is with them. Michael was my ancestor’s brother. 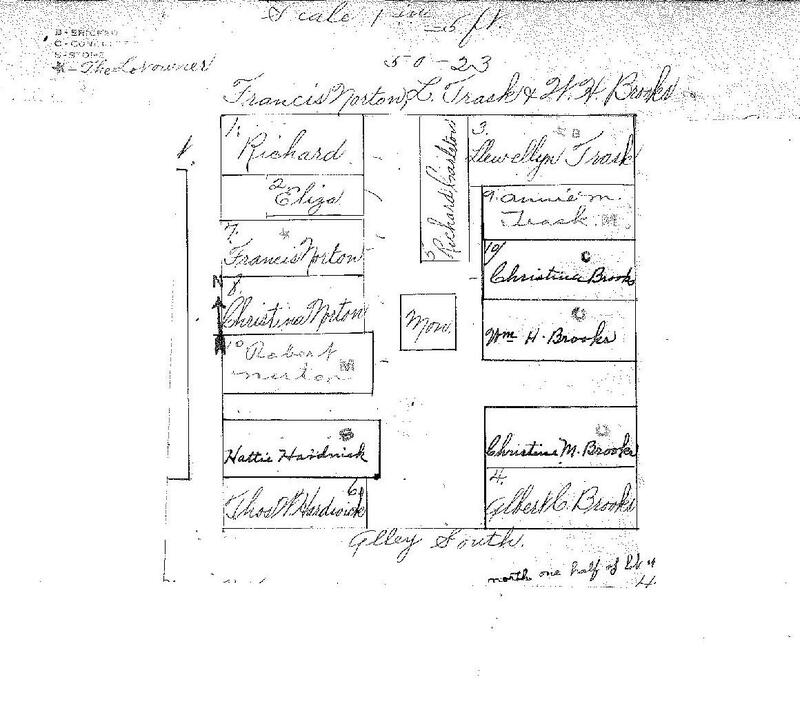 In 1901 Census the children of Michael are listed as living at house 1 in Clucka North in King’s Co. John, MaryAnne, Johanna, Michael, Henry, William and Elizabeth Torpy are all listed. 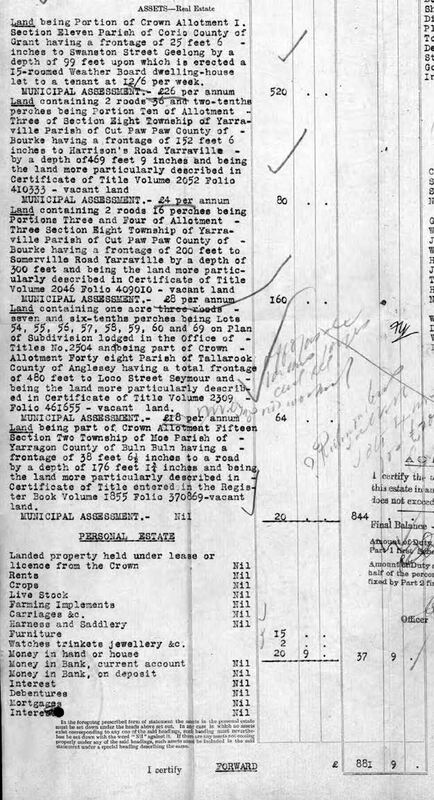 The 1911 Census records show that the parents, Michael and moved from Lissadonna to the Clucka North property. 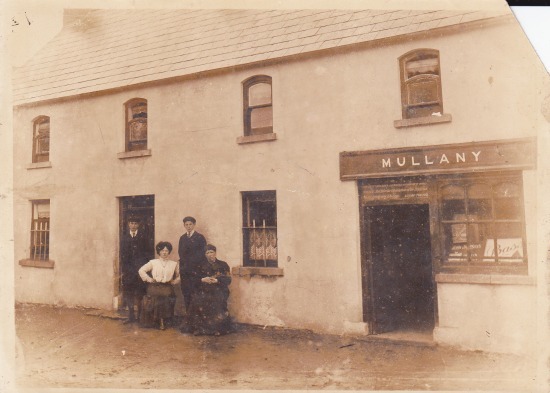 In the 1911 Census Michael and his wife Mary and Henry and William their sons were living in House 1 Clucka North Kings Co. John Torpey and his wife moved to Lissadonna and were living there in 1911 with their two children: Maureen and Michael and nephew Joseph Liffey. The first related Torpey to come out to Australia was Daniel Torpey. He was born around 1830. I recently came across their emigration record. 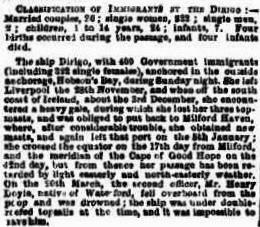 Daniel and Anne and their baby Maria arrived at Geelong in Victoria on 17 Jan 1854 aboard The Prince Alfred. There was also a Mary Ryder on board who might have been a cousin to Daniel. 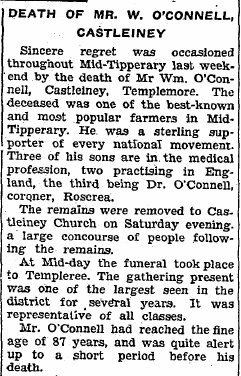 His father was also Daniel Torpey, a farmer at Lissadonna Co Tipperary and his mother was Mary Rider. I recently came across a Baptism record for his brother, Patrick Torpey. 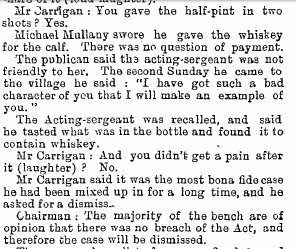 He was baptised in Dunkerrin Parish, Kings County (Co Offaly), on 28 Mar 1830. His godparents were Michael Torpey and Honor Cleary. Daniel Torpey, my grgrgrandfather, was 59 when he died of hepatitis in Melbourne Australia. He was married to Anne Kilkeary in Ireland about 1850. She came from the next county, Queens Co, now Laois. Anne and Daniel had seven children. Their first child, Maria, was born in August 1852 in Co Tipperary Ireland in the parish of Borrisokane. 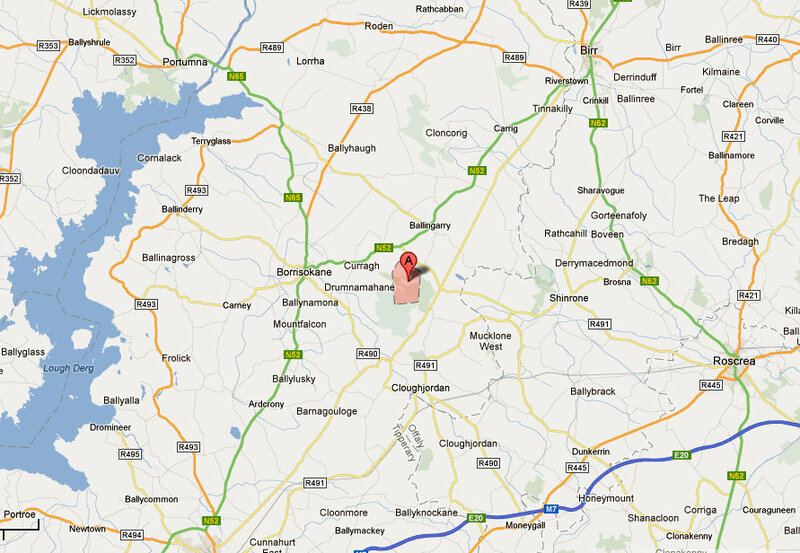 The area where Maria Torpey was born in 1852 in the Parish of Borrisokane Co Tipperary Ireland. 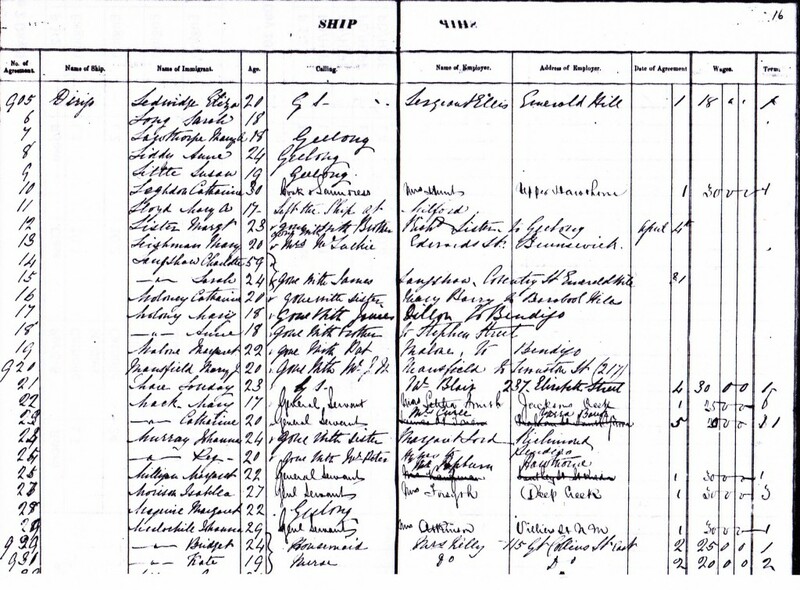 A = Sopwell, their address on Maria’s Baptism record in 29 Aug 1852. 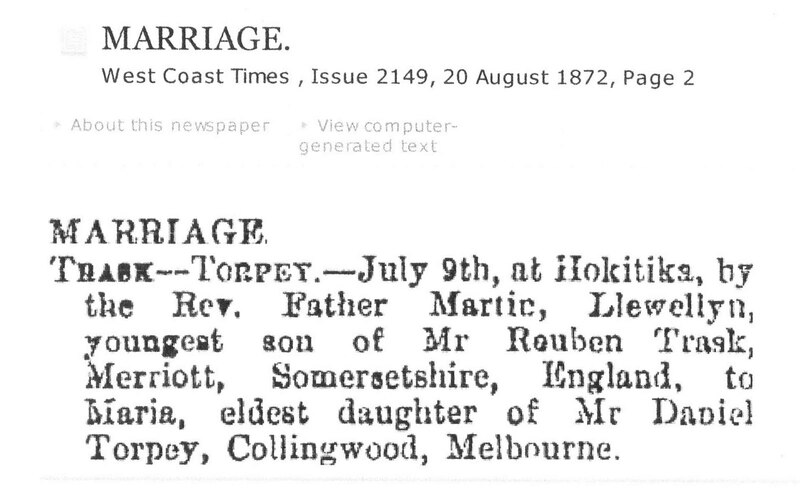 I had difficulty finding Maria’s birth/baptism record as her father’s name was written as Turpey! Mary Ryder’s sister. Some DNA test connections support this theory. 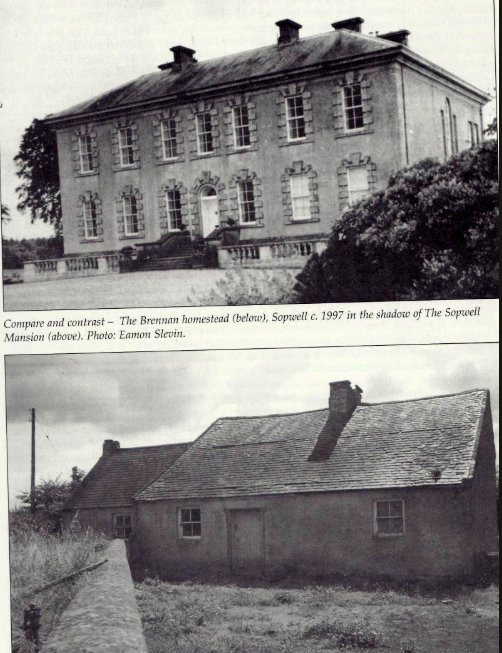 Sopwell Hall and below the Brennan’s house from The Brennans of Borrisokane by Louis Brennan. Maria Torpey may well have been born in this house. Their second child, Patrick, was born in 1855 in Hawthorn Victoria Australia. So they immigrated between 1852 and 1855 and may have come from an area on the border of all three counties. 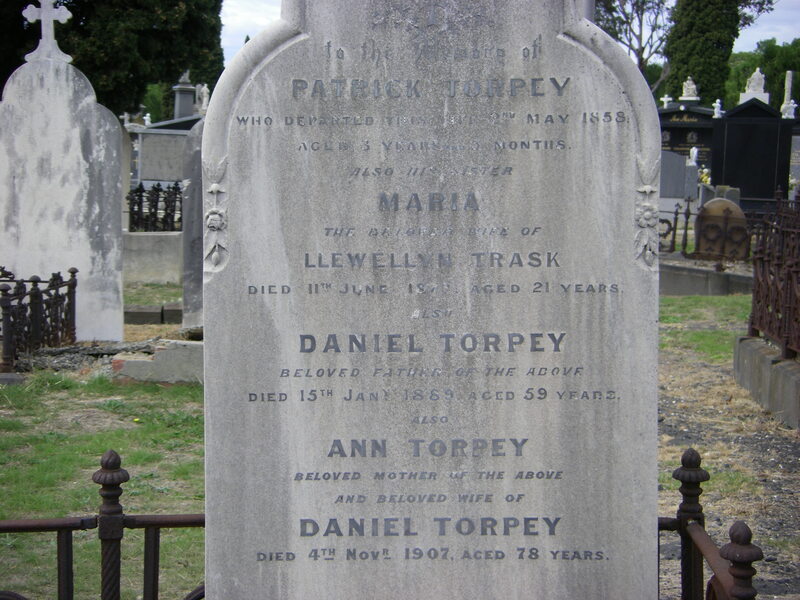 Anne and Daniel Torpey had seven children: Maria 1852-1873, Patrick 1855-1858, Katherine 1858-1930, Daniel 1861-1924, Margaret , my great grandmother, 1863-1896, John 1865-1931 and Annie 1868-1950. 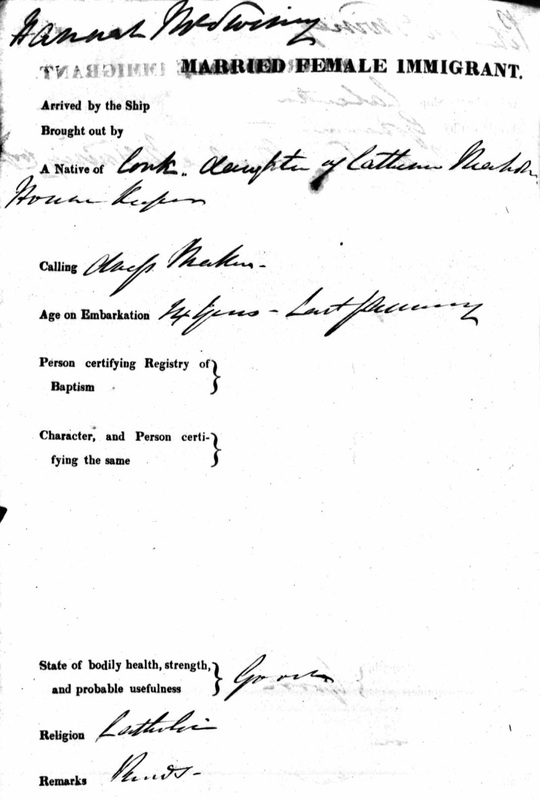 On his daughter Katherine’s marriage certificate his occupation is given as cab proprietor. Maria married Llewellyn Trask on the 9th of July in 1872 in Hokitika New Zealand. She was 21 and Llewellyn 22. Llewellyn was from Merriott Somerset Shire in England. He and his family had emigrated to new Zealand. Rev Dean Martin who married Maria and Llewellyn. I have always found it strange that Maria should be married in New Zealand or what she was doing there. 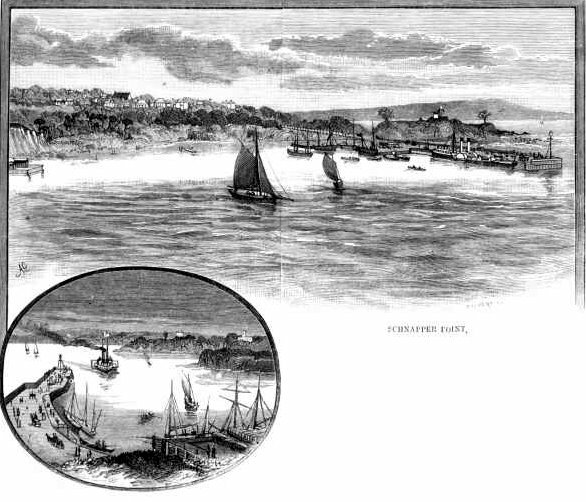 Hokitika experienced a gold rush in the 1860s. The population of 1,000 had swelled to over 50,000 by 1866. 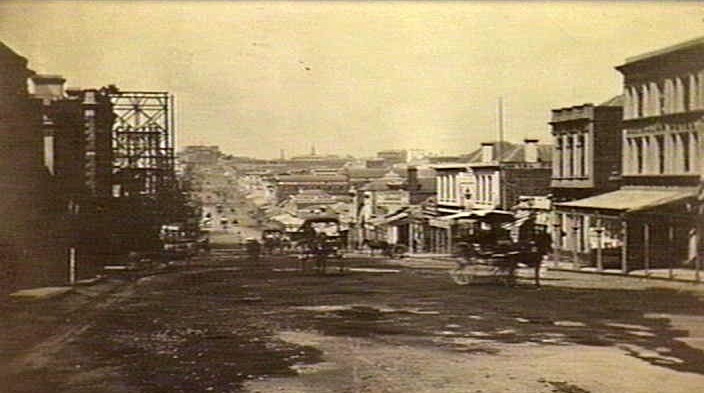 Many of the prospectors came from Melbourne and it was described as a “suburb of Melbourne”. 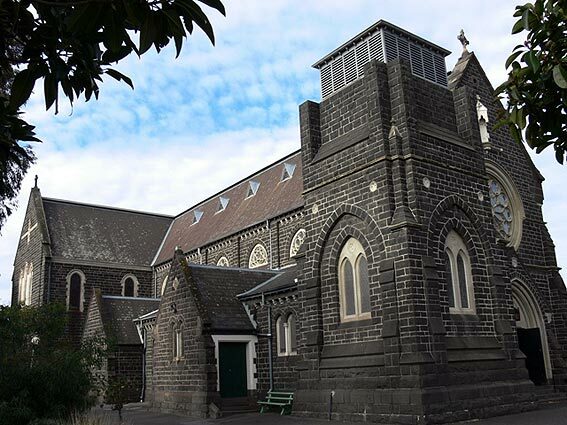 She was also not married in St Mary’s Catholic church in Hokatika but in the home of Thomas Tully, a butcher and his wife Bridget, in Fitzherbert St Hokitika. They were married by Father A Martin, the Catholic Parish Priest. Maria Trask nee Torpey died nine days after giving birth. She is buried in the Torpey family grave in Melbourne Cemetery Victoria Australia. Her child was reared by the Torpey family. 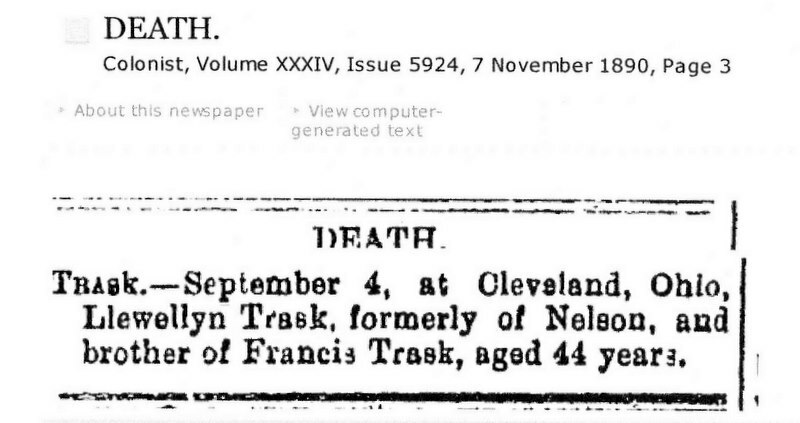 Llewellyn Trask went to Cleveland Ohio where he settled and remarried on Feb 4, 1876. There do not appear to have been any children from this marriage. Annie was the daughter of Francis Norton and Christiana Lawrence and was born in Merriott in Somerset shire England in 1856. Annie and Llewellyn came over to Australia in 1887 and Llewellyn junior went back with them and lived and worked as a butcher until his father’s death. He then came back to Victoria and settled. Llewellyn died on 3 September 1890, aged 39, from congestion of the lungs, which seems to have been after an operation. His death was reported in the New Zealand paper The Colonist on Nov 7 1890. He lived at 1428 Pearl St Cleveland where he worked as a butcher. He is buried in the Riverside Cemetery. His brother Francis was Mayor of Nelsen on the south island of New Zealand. Llewellyn Trask junior married Catherine Miller (1875-1954). 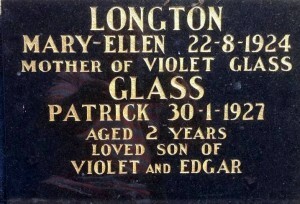 Their children were Llewellyn Trask born 1901, Francis Reuben born 1904 and Veronica born 1906. Llewellyn Charles born 1873 died in 1942 aged about 69. 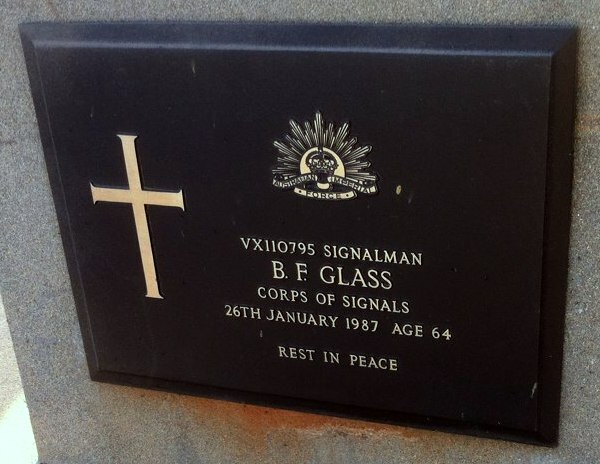 He is buried in Fawkner Cemetery in Melbourne. His son Llewellyn married Selma Salisbury in 1930. He died in Hampton, Melbourne in 1976, aged about 74. 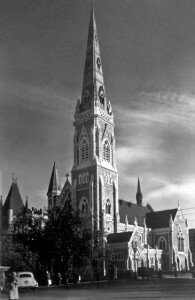 Daniel and Anne’s second daughter Katherine married John Horan in St Ignatius’s Church in Richmond Melbourne on 28 April 1886. She was 26. Her husband John Horan was born in Collingwood in 1860 and died there in 1931 aged 71. 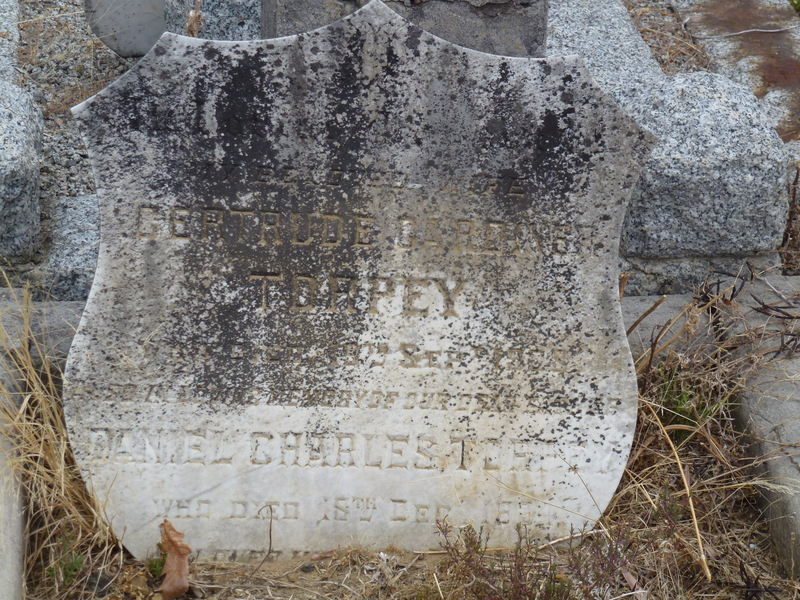 Daniel Charles Torpey married Gertrude Gardiner Woolley. They lived in Abbotsford, Collingwood. 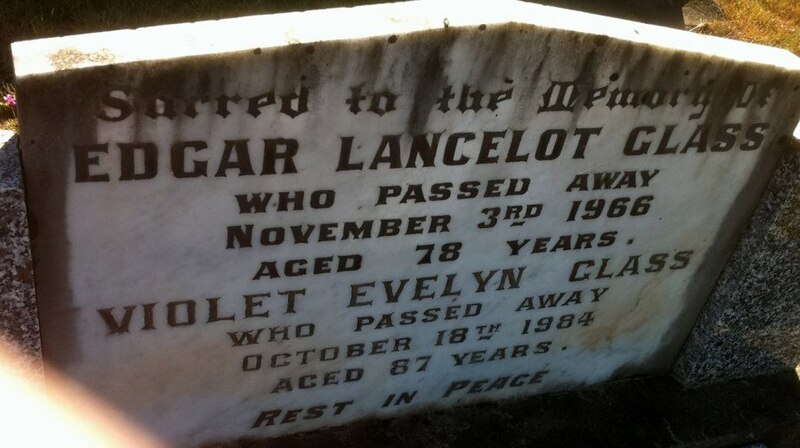 He died in Kew in 1924, aged 63 and is buried in Boroondara Cemetery Kew Melbourne with his wife Gertrude. 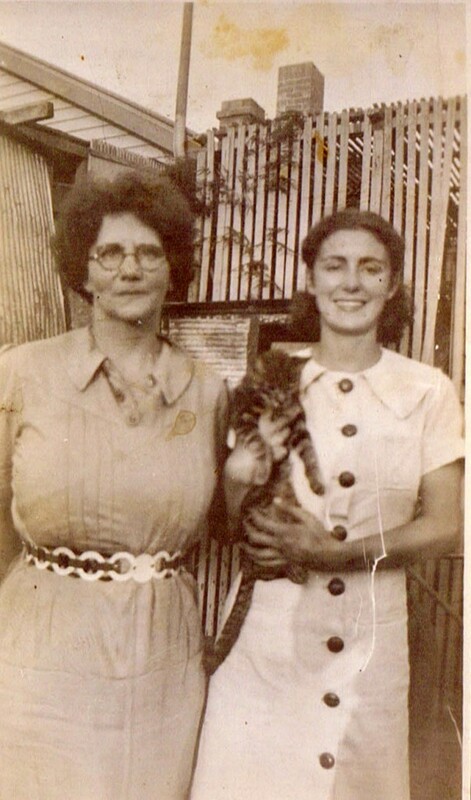 Their third daughter was my great grandmother Margaret. Margaret married William Charles Knighton in 1893. On her marriage record her place of birth is given as NSW which is mysterious or perhaps a transcription error. On the actual document it is Camperfield Sydney Rd. Hence the mistake. 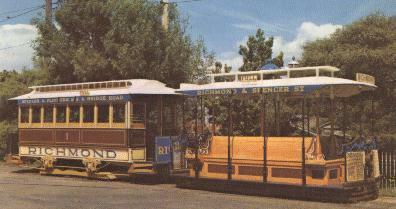 William Knighton was a tram employee at the time of their marriage and Margaret a servant. They were both 28. They had two children Mary and James, my grandfather. See the Knighton Family post for more on this side of my family. Margaret died after the birth of her second child, Mary. Annie Torpey, the youngest child of Daniel and Anne, was married to Thomas Leahy in 1915 (1864 -1924). They lived at 104 Ford St Ivanhoe Melbourne. In the 1903 census she is listed as a saleswoman. She was living with her mother and brother John at 29 Baker St Richmond Melbourne. John was a driver. In 1914 he was living at this address with Llewellyn Charles Trask, a butcher and his nephew. Annie was 84 when she died in Ivanhoe, a suburb of Melbourne, in 1950. The main family surnames on my mother’s paternal side are Knighton, Ledwich or Ledwidge and Torpey. 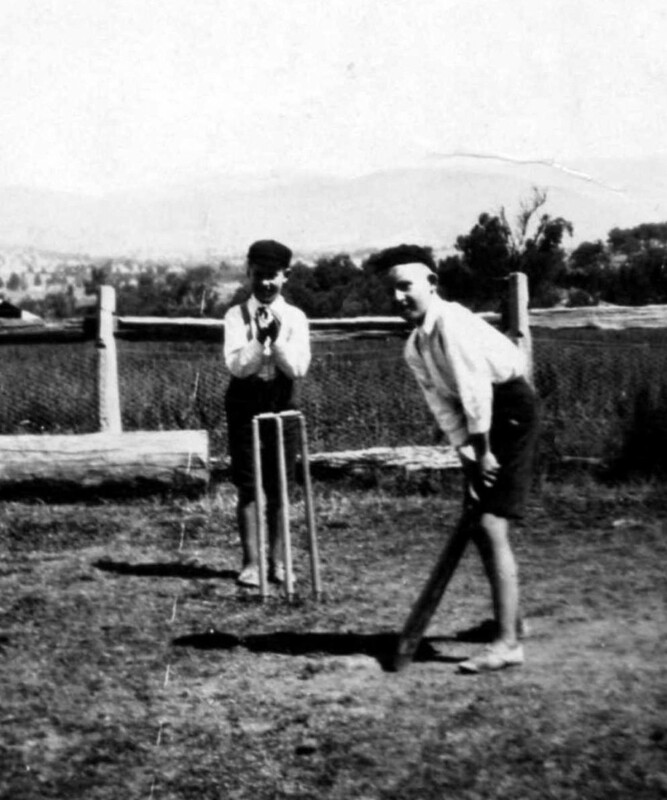 The first Knighton in our family to come out to Australia from England was James Knighton, my great great grandfather. 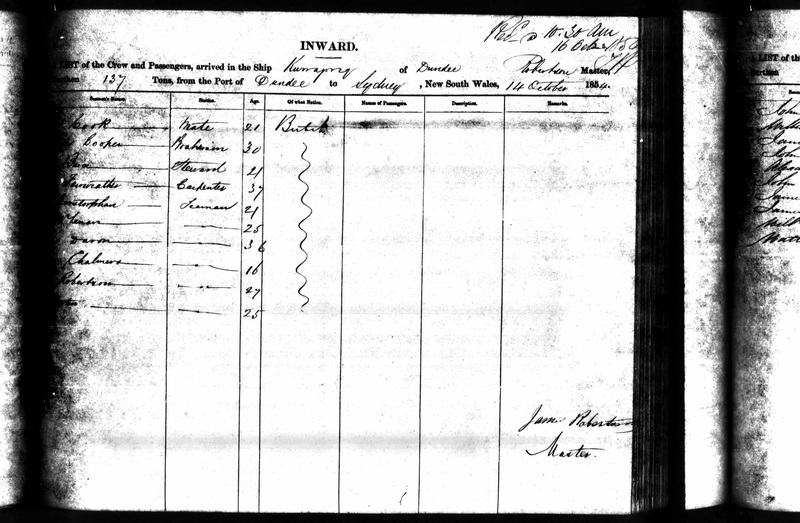 There is a James Knighton, age 25, who arrived at Port Phillip bay from London on 9 July 1853 on the Sir Henry Hardinge. His birth date given as about 1828. 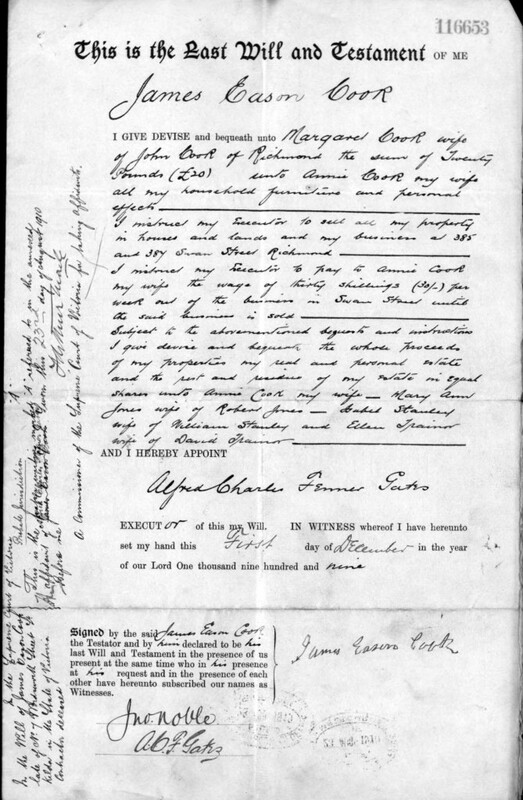 His death certificate says he had been in the colonies for about 30 years. If this is accurate he would have immigrated about 1853. He married Eliza Ledwich on March 1, 1864 in Scots’ Presbyterian Church Melbourne Victoria Australia. James worked as a coachman in 1864 and his father James’ occupation is listed as groom. The Mary Ledwidge who witnessed the wedding was a sister of Eliza’s. 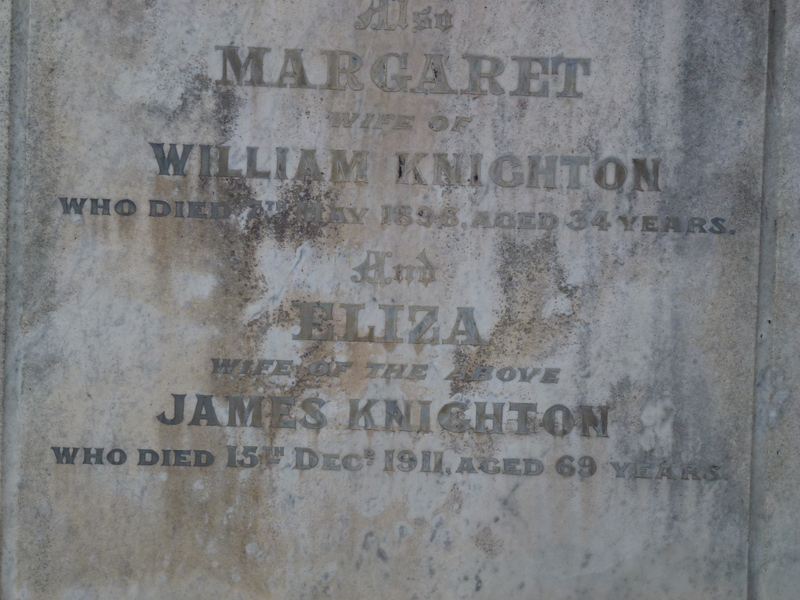 James Knighton died in November 1883 age 45. At the time of his death he was living at Crown St Richmond and he died of renal cancer after a three month illness. His occupation was listed as manager. His father’s name was also James and his mother was Louisa. Her maiden name was not entered. The informant was James Beamish, his brother-in-law, who was living at Stanley St Richmond and married to his wife’s sister, Margaret Ledwidge. Two children are listed: William age 18 and James deceased. 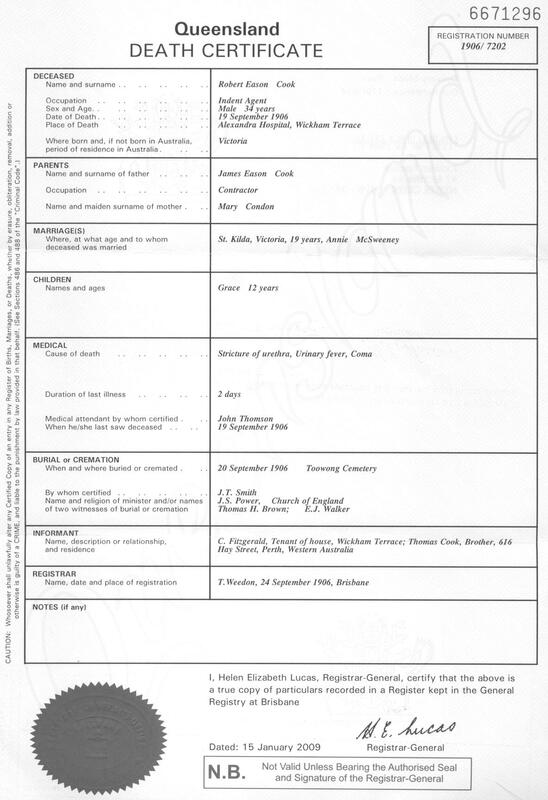 On his death certificate it says he was born in Chelsea England whereas his marriage certificate has him being born in Jersey which is in the Channel Islands also part of England. I looked at all the census records for Jersey and no Knightons are listed at all. In the English mainland census records there are many Knightons. I think that his thick accent may have made Chelsea sound like Jersey. I have been unable to find any birth records for him with James and Louisa Knighton as parents. 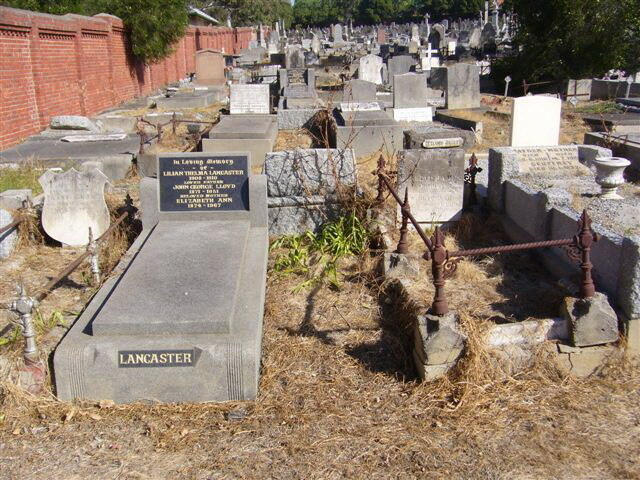 James is buried with other family members in Boroondara Cemetery Kew Victoria. Grave of James Knighton, his infant son James, Eliza Knighton nee Ledwich and Margaret Knighton nee Torpey. Eliza Knighton nee Ledwich died in Dec 1911. Eliza Ledwich’s family history is described more fully in this post Ledwidge or Ledwich Family History. 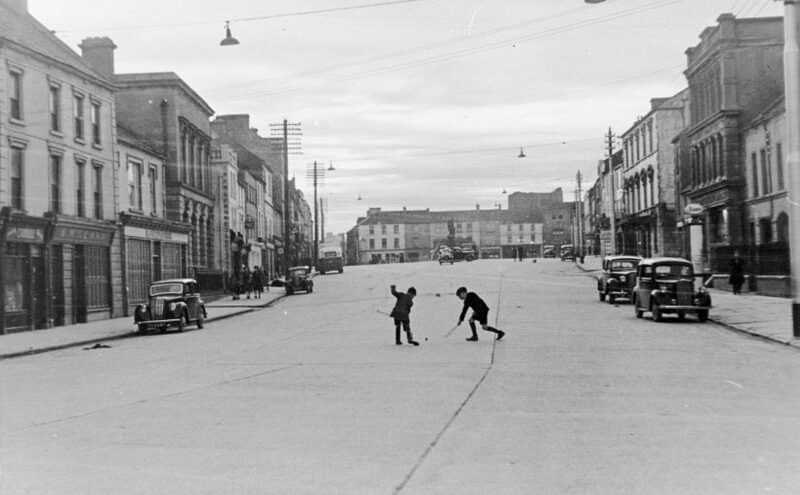 The Knightons lived in the inner Melbourne suburb of Richmond their whole lives. James and Eliza Knighton nee Ledwidge had three children. William James, my great grandfather, was born in 1864, James Edward was born in 1866 but died aged 20 months. 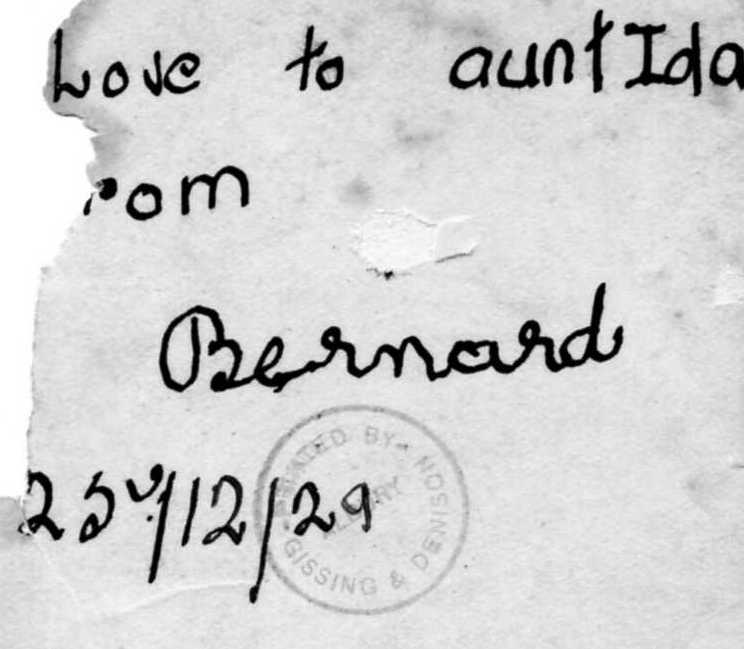 Richard was born in 1867 but there are no other records other than his birth registration so it is likely he died as a baby. 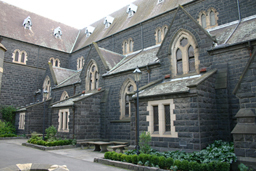 William James Knighton married Margaret (Maggie) Torpey in at St Ignatius’ Catholic Church 326 Church St Richmond Melbourne. She died in after giving birth to their second child Mary. 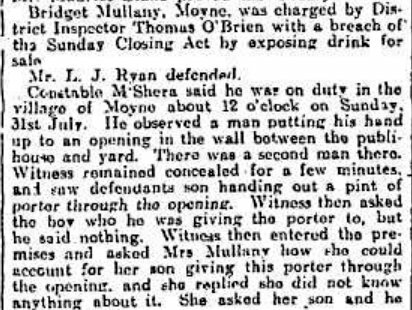 This post Torpey Family History has a lot more on the Torpey family. In the census of 1909 for Victoria William was living with his mother Eliza at 8 Crown St Richmond. He worked as a labourer from 1909 to 1924. On his son James’ death certificate his occupation was given as coach builder. In 1914 he was still at 8 Crown St but from then on he was living at 4 Crown St Richmond. He died in 1925 aged 60 from cardiac failure. 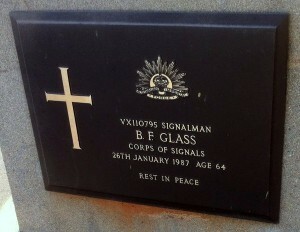 He is buried in Burwood Cemetery. 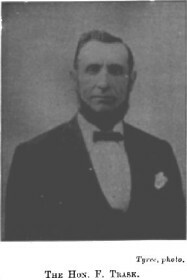 James, his son, was present when he died and was living at 160 Cowper St Footscray. James Knighton in football jumper. Unknown club. James (Jim) my grandfather served in WW1 and had injuries to his knee and leg. He was injured fighting on the Somme in 1918. This injury continued to give him pain throughout his life. He worked as a tanner. He enlisted on the 8th of May 1916 in Melbourne. He was 5′ 9 3/4″ tall and weighed 162 lbs and was 22 years and two months old. His religion was listed as Catholic. He served in the 12th Army Field Artillery Brigade of the A.I.F. He was a gunner. He served on the Western Front in France and Belgium. 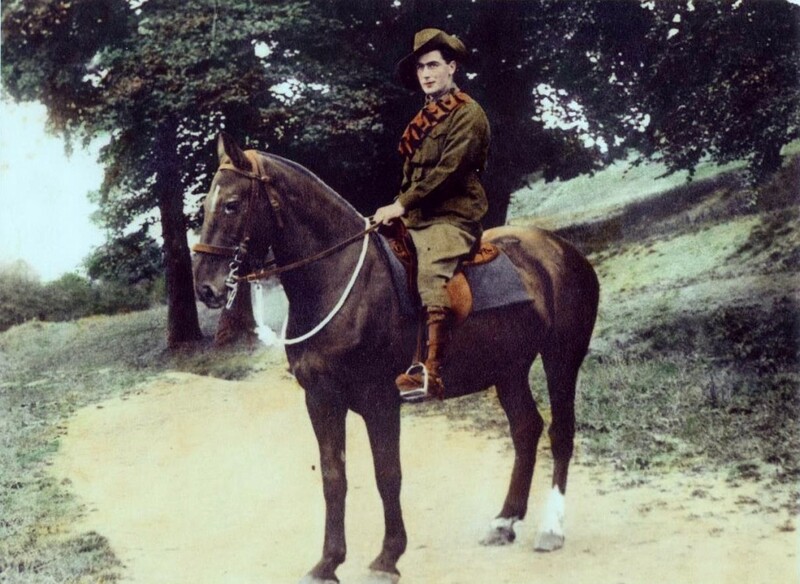 He embarked on the “Borda” from Melbourne on Oct 20 1916. On the 28th Nov 1916 he broke ship and was AWL from 8 pm on that date until arrested by the guard. He was given 24 hrs detention. 23 Nov 1917 He left from Southampton for France. 24 Nov 1917 Marched in ex-England. Place: Rouelles France. 26 Nov 1917 Marched out to 12th (A) F A Bade Rouelles. 19 April 1918 Drunk on the field on active service. Given 10 days ? 22 August 1918 Wounded in action France 12 Army Bde. at the second Battle of the Somme which commenced on August 21. The battle took place along the northern part of the river near Baupaume. 28 August 1918 he was admitted to hospital in Cheltenham England for right knee and left thigh injuries. 29 Jan 1919 Disembarked Australia. He was medically discharged. His discharge papers state he is totally incapacitated. James Knighton is in the centre. Date Unknown. 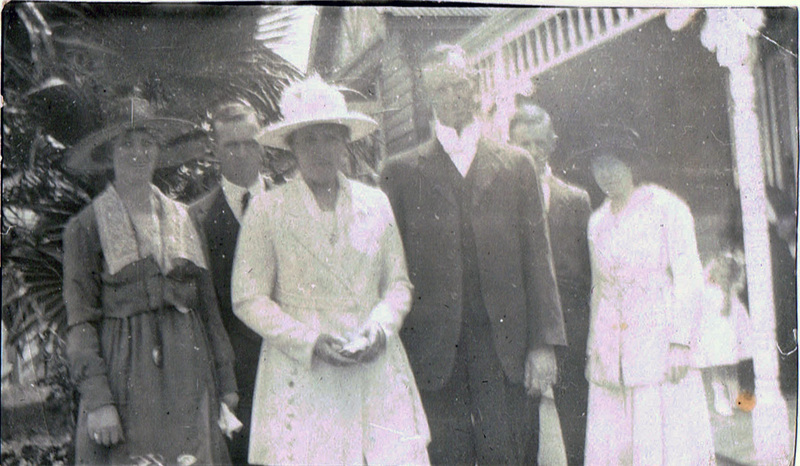 In 1921 Jim Knighton married Grace Annie Frances Cook in Richmond Melbourne. They had two children, Winifred and James. James died in hospital after birth. The marriage foundered and James left and went and lived with a french woman, Juliette. Jim Knighton’s sister Mary married Henry Edward Miller and they had four sons, Henry, Bruce, James and Edward. 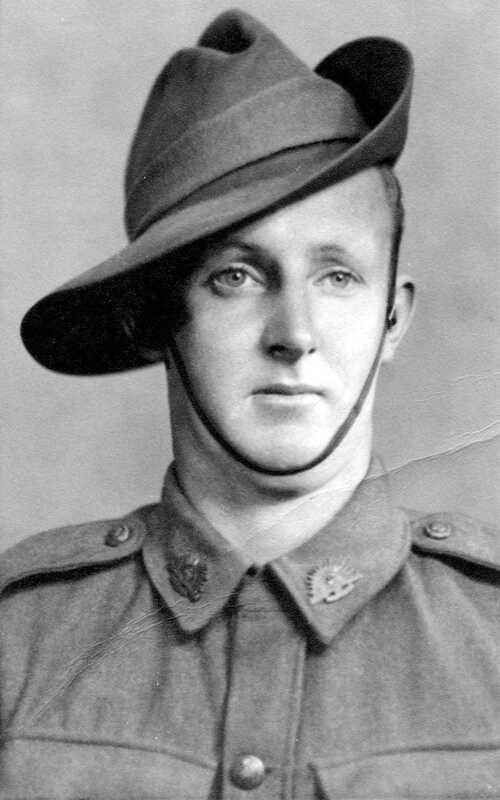 James “Jim” Knighton died in 1945 aged 52. Last address of James Knighton. 188 Drummond St Carlton Melbourne. 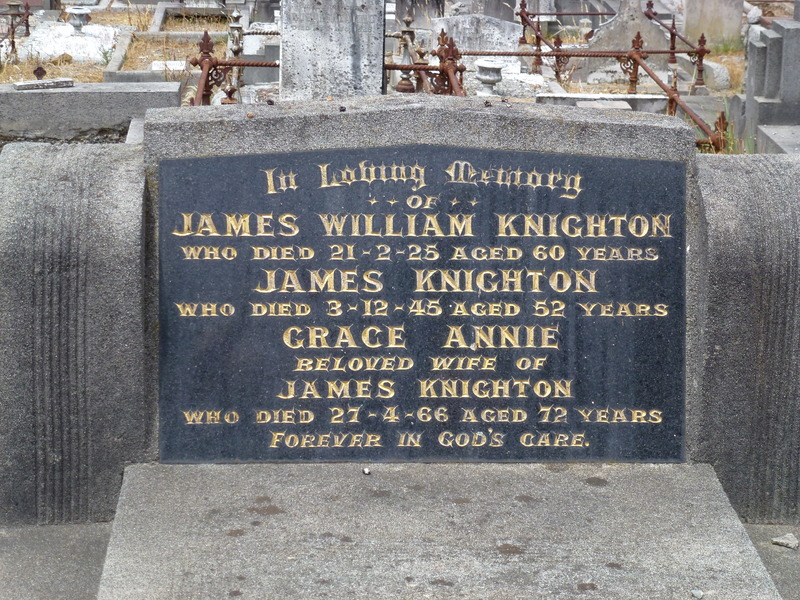 James William Charles Knighton was the last son of this Knighton family descended from James and Louisa Knighton. 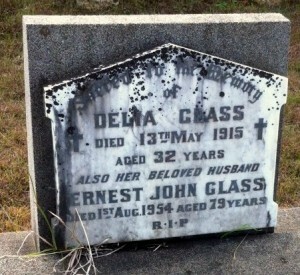 He is buried in Burwood Cemetery Melbourne with his father and wife Grace Cook. James Knighton and Grace Cook had two children. A boy died at birth. I was told “he didn’t come home from the hospital”. Winifred Helena Knighton their only daughter was born 14 Sept 1920.